Cozy and charming, our 1-2 bedroom cabins are the perfect fit for honeymoons, romantic getaways, quiet weekends on your own, or smaller families. Big things come in small packages in these cozy getaways that boast everything from game tables and fully equipped kitchens to spacious decks and inviting bedrooms. Search for the perfect getaway for YOU or give our Vacation Planners a call at 1.800.684.7865! With community pool access and a miniature golf course through Bear Creek Crossing Resort, Ever After offers more than your average vacation rental in Pigeon Forge. This 1-bedroom, 1.5-bathroom cabin for 6 features an outdoor flatscreen TV, soothing hot tub, rec room with fun games and an adorable kids’ corner, and an indoor jetted tub plus fireplace in the king master suite. 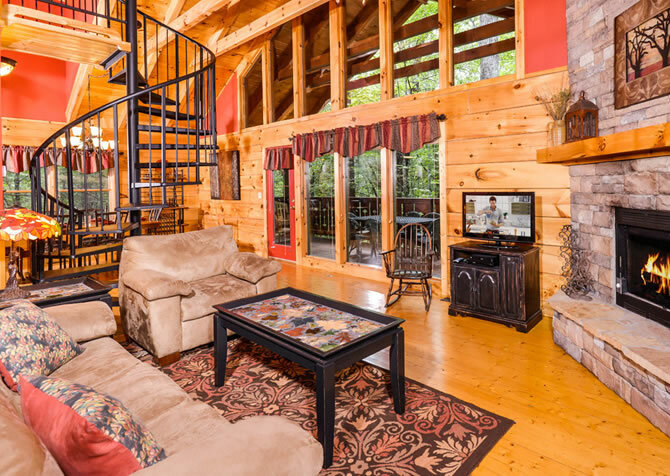 Great for small group getaways, this 2-bedroom + loft retreat in Pigeon Forge packs a punch when it comes to fun. Play pool and foosball, take advantage of the high-speed Wi-Fi, and then unwind in the outdoor hot tub before climbing into king-size beds or soaking up mountain views! 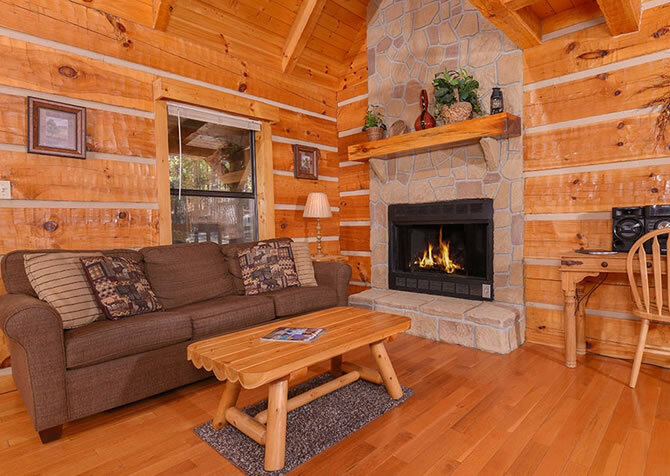 With a welcoming log interior and cozy furnishings, you will feel right at home in this 2 bedroom Pigeon Forge cabin rental. Only minutes from downtown Pigeon Forge, Good Times offers a covered deck with hot tub and rocking chairs after busy days playing downtown. 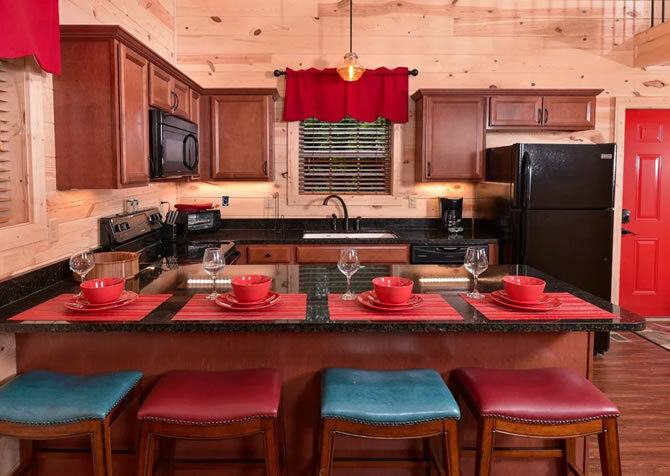 A large kitchen, open living space, and washer/dryer are additional features that offer comfort and convenience on your Smoky Mountain escape. 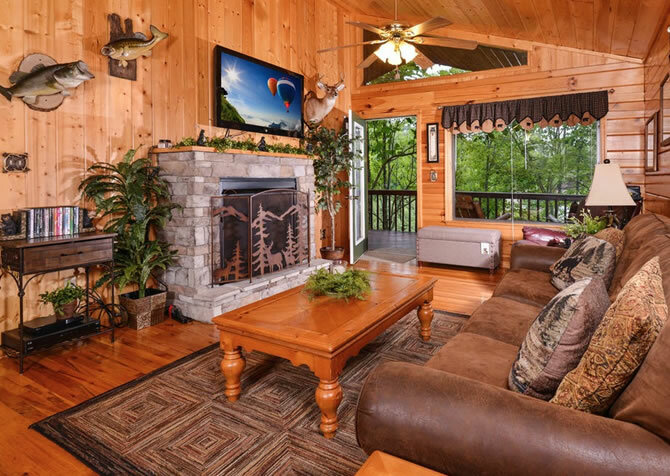 Plan a couple’s getaway or single family vacation to High-Bear-Nation, where you’ll find plenty of space loaded with the comforts of home and decorated in Smoky Mountain style. Play on an air hockey table, or watch a favorite Blu-ray on the big screen. Then soak in your indoor jetted tub or outdoor hot tub on the porch. High-Bear-Nation offers all this as well as pool access in the Sherwood Forest! Plan your romantic getaway or family vacation to Sanctuary, a 1,200-square-foot cabin surrounded by the Smoky Mountain trees. 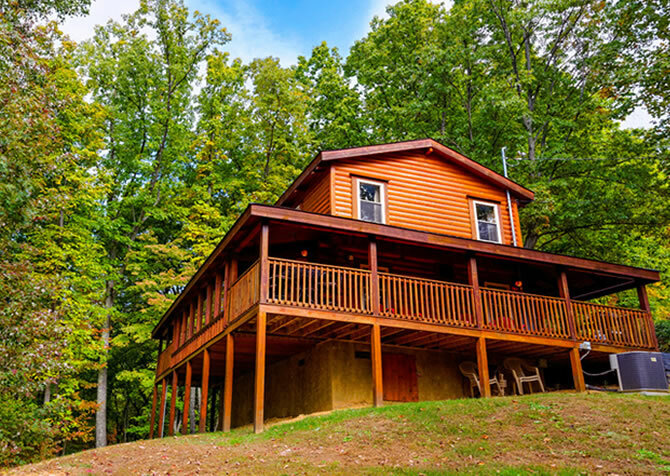 This cozy cabin is conveniently located in Sherwood Forest and offers a game loft, a fully equipped kitchen for making in-cabin meals, high speed Wi-Fi, and a flat, paved driveway. You’ll feel right at home at Sherwood Sanctuary! A 2-bedroom cabin with room for 8, Lucky Enough is also pet friendly so you don’t have to worry with boarding or leaving your best friend behind. Bring your pup to relax in the cabin while you soak in the hot tub or play games! 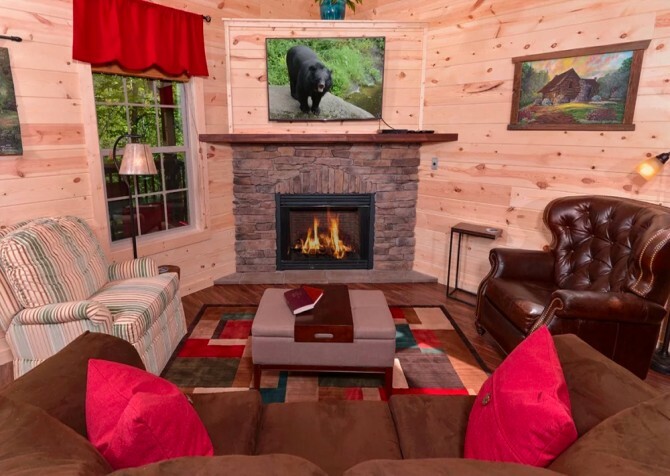 Slip away for a romantic couples' weekend, a getaway with friends, or a fun family vacation to As Good As It Gets - a pet-friendly cabin not too far from the attractions, restaurants, and shops of downtown Gatlinburg. 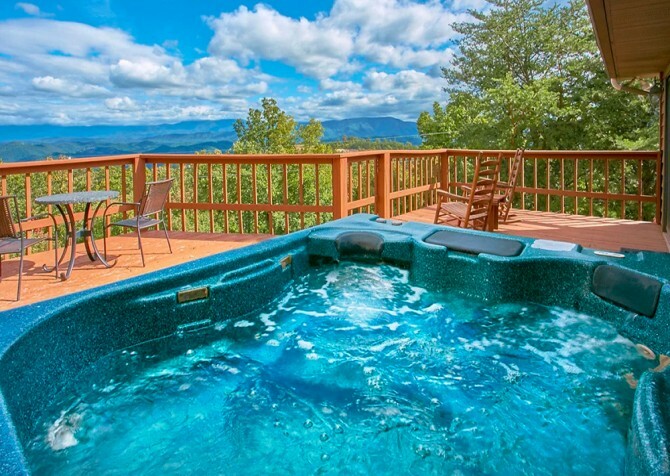 Spend days soaking in the outdoor hot tub, shooting pool in the game room, and enjoying beautiful tree-studded views of the Great Smoky Mountains. 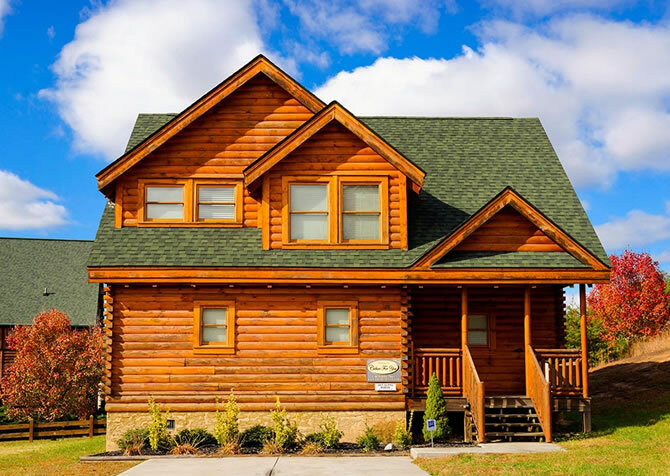 Luxurious and well-appointed, this charming cabin is only minutes from the downtown Pigeon Forge Parkway. The 2 master bedrooms are lovely suites, featuring king-size beds and double-sided gas fireplaces that face your bed and indoor jetted tubs. 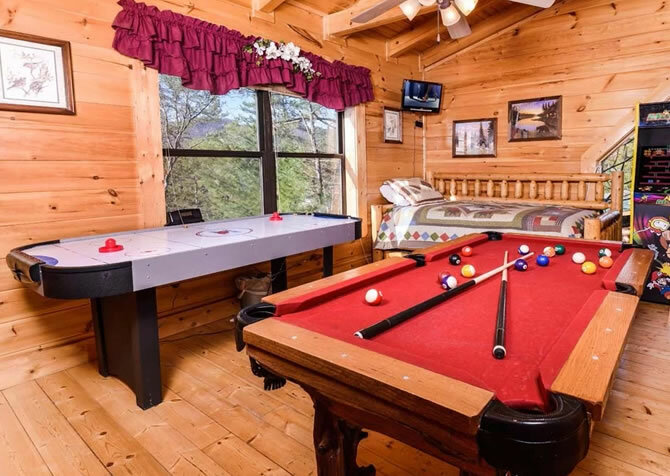 Play pin ball or pool in the game room or retreat to the outdoor space that offers a hot tub and outdoor gas fireplace for cool mountain nights. This patriotic-themed cabin is a wonderful choice for a family vacation or a getaway with a few friends, offering 2 bedrooms and sleeping up to 8 guests. 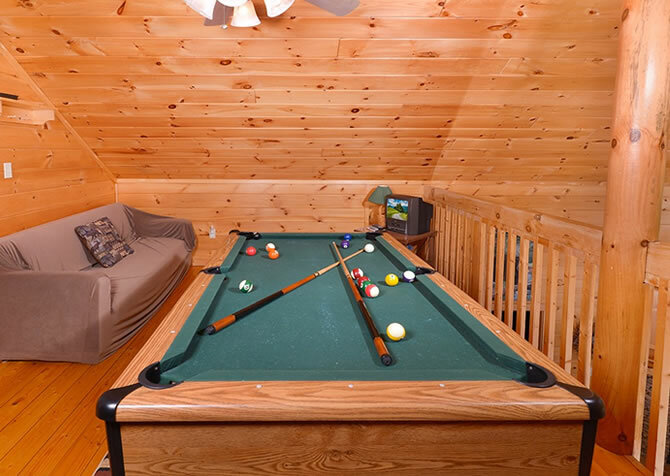 This semi-private cabin features all of the amenities you could ask for, including wireless internet, a hot tub, pool access, several game tables, and a 120-game arcade for days of fun in the cabin! 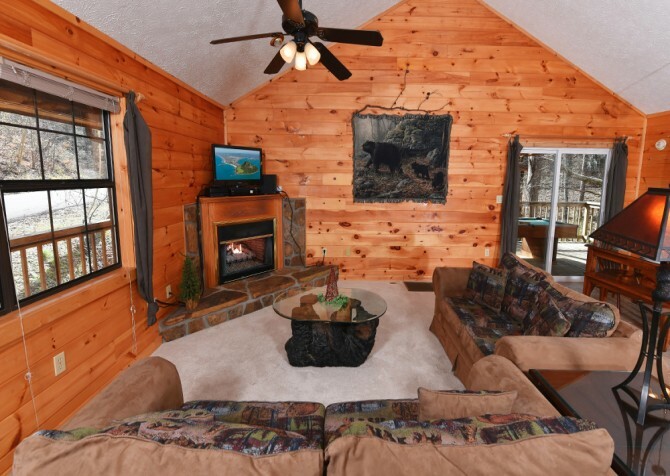 Featuring an open-style living area and kitchen, this 1-bedroom Pigeon Forge cabin allows you to feel right at home. Log interiors invite you in, while the master bedroom boasts an electric fireplace and bedside jetted tub for an evening soak and relaxing night. You'll even have access to an enclosed swimming pool, allowing you to take a dip no matter the weather outdoors. 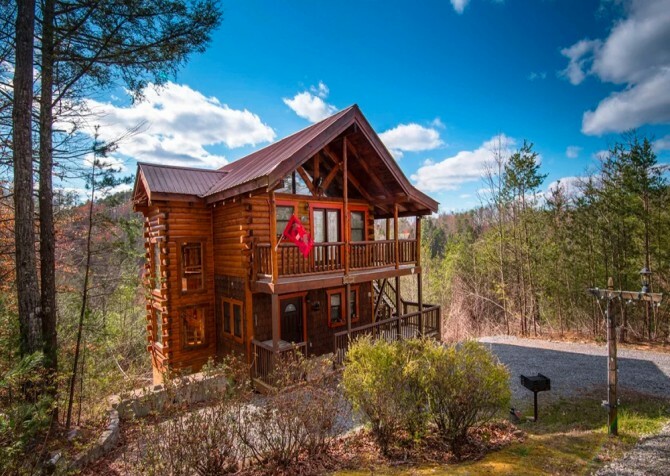 Come home to your charming 1-bedroom cabin after starry-eyed days touring wineries, sightseeing from the Gatlinburg Sky Lift, and shopping for the perfect anniversary gift you can only find in the Great Smoky Arts & Crafts Community. Then slip into the warm, bubbly waters of the heart-shaped tub in front of the rustic fireplace. 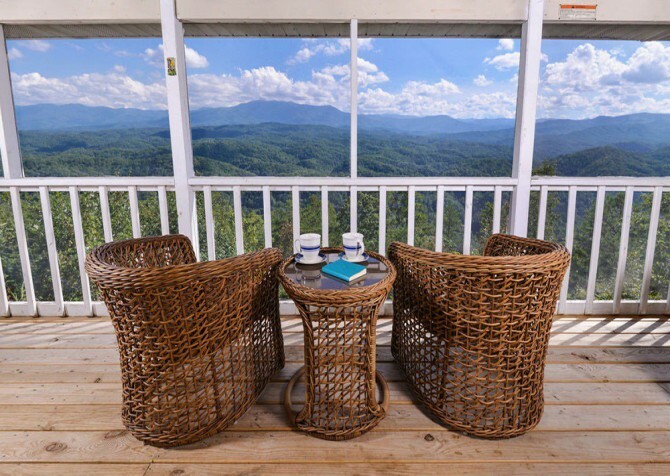 Minutes from downtown Gatlinburg, Turning Leaf features a beautiful spiral staircase, a fully equipped kitchen, enchanting wooded views, and cozy furnishings. With a king-size bed in the bedroom, a queen-size bed in the loft, and a sleeper sofa in the living area, this cabin can sleep up to 6 guests. Host family game night with the provided board games or watch a thriller on the flatscreen TV! 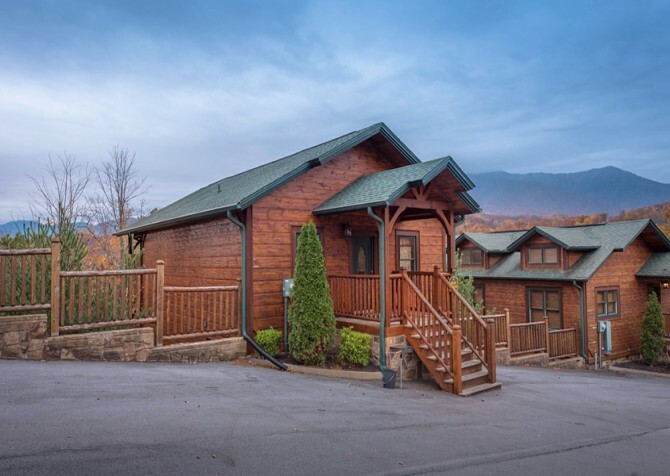 Featuring 1 bedroom, 2 bathrooms, and room for 6 guests, Almost Home is a great option for family vacations and trips with friends to Pigeon Forge. Host movie night on the big screen TV, play pool in the upstairs loft, compete on the community tennis courts, unwind with a spa bath in the jetted tub, and snuggle with your spouse in the king-size bed! 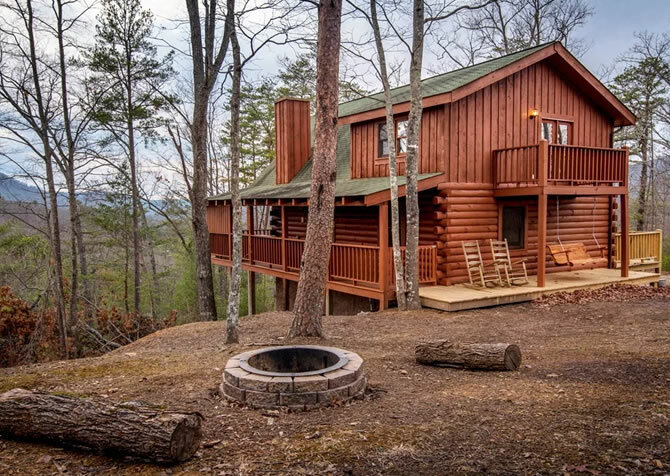 For a romantic couples’ retreat or fun family trip, look no further than Charlie Brown’s Cabin, a 2-bedrooms, 3-bathroom, log cabin for 6 in Pigeon Forge. 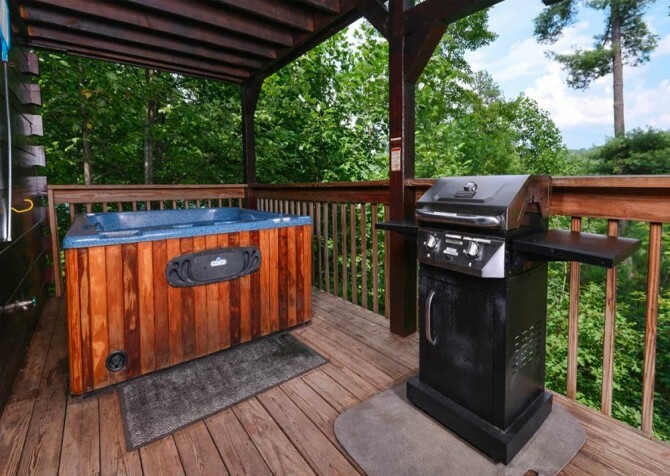 Enjoy wooded and mountain views from the covered deck, fire up the gas grill for barbecue parties, play games in the loft, splash at the community pools, unwind in the hot tub, and head to dreamland on a king-size bed. 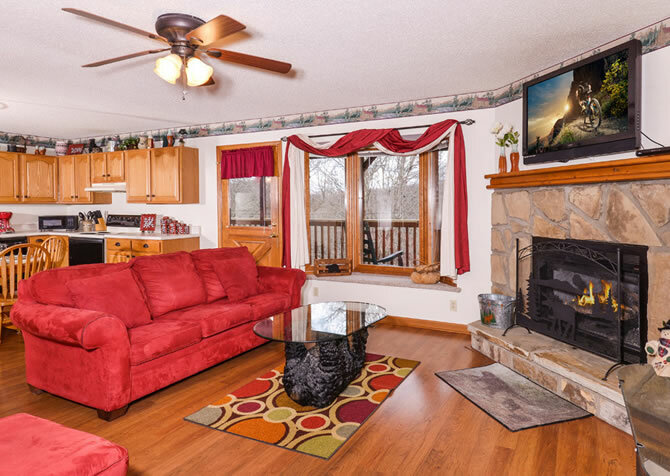 Located just 3 miles from downtown, this 2-bedroom cabin has room for 6 guests. It offers comfortable king-size beds and lots of entertainment, including an air hockey table, pool table, and big screen TV. 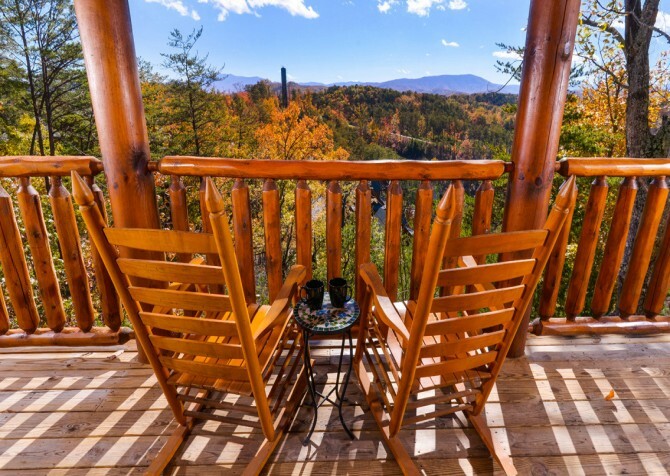 Outside, enjoy mountain views from the rocking chairs or the hot tub! It also features a fully-equipped kitchen, flat driveway, electric fireplace, pool access, and high-speed wireless internet! Featuring a bubbly outdoor hot tub, 2 wood-burning fireplaces, a spacious master suite with a king-size bed, and an open-concept living area with a big screen TV, The Tree House is perfect for romantic weekends away or a much-needed escape from everyday life. This 1-bedroom, 1.5-bathroom cabin sleeps 4 and comes with homey conveniences, like a full kitchen and free Wi-Fi. 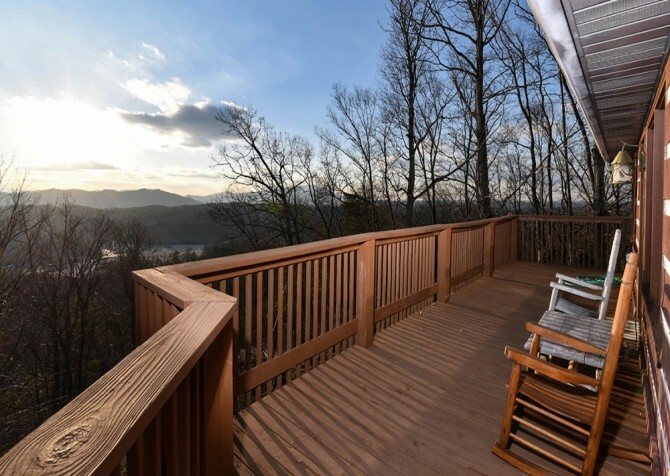 Enjoy the sight of the sun setting over the Great Smoky Mountains from the large deck of this Pigeon Forge cabin. This 1-bedroom +loft cabin boasts an inviting wood-burning fireplace and fully equipped kitchen for all of your cooking needs. Challenge your friends to a game on the pool table, treat yourself to a soak in the indoor jetted tub, and breathe in the fresh mountain air. Along with sleeping space for 6, Close to Heaven provides a variety of amenities to entertain your group. These include a pool table, an outdoor hot tub, and pool access inside the Pin Oak View resort. 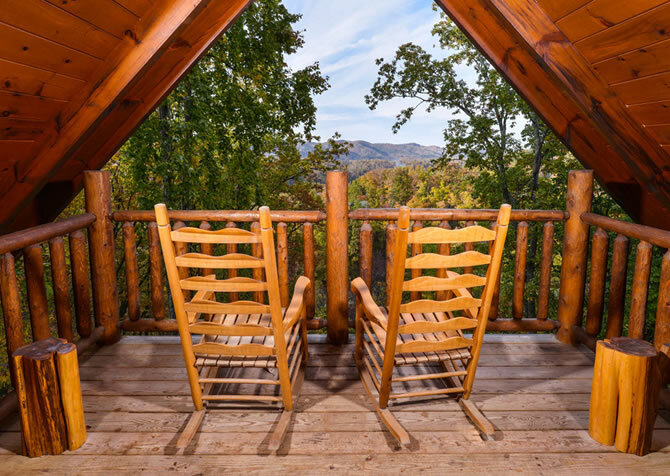 If you’re looking for a cabin with an easy drive to Pigeon Forge and the right mix of amenities for a fun and relaxing stay, you can’t miss Close to Heaven in the Smokies! 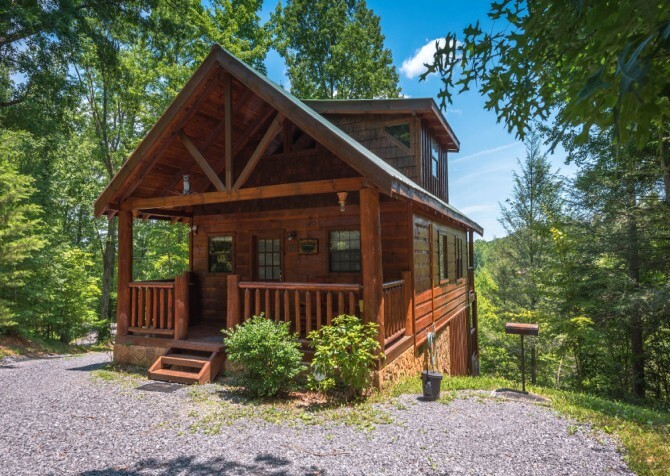 This gorgeous 1-bedroom cabin boasts serene wooded and mountain views of the Smokies, a large stone indoor jetted tub only footsteps from the king-size bed, a fully loaded kitchen to prepare romantic meals, and a foosball table and pool table in the loft rec room. With space for up to 10, this 2-bedroom getaway is great for groups of friends and larger families! 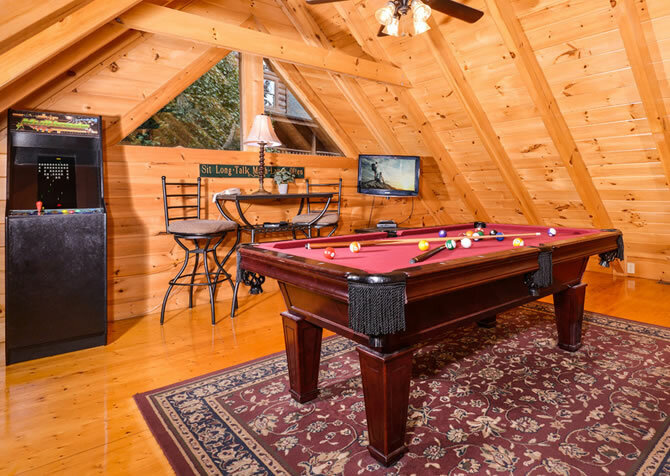 At Smoky Mountain Escape, spend nights watching movies, shooting pool, playing air hockey, or relaxing in the hot tub after exploring downtown. The beautiful natural wood, flattering stone, and quaint mountain décor create the perfect atmosphere for a memorable Smoky Mountain Escape. 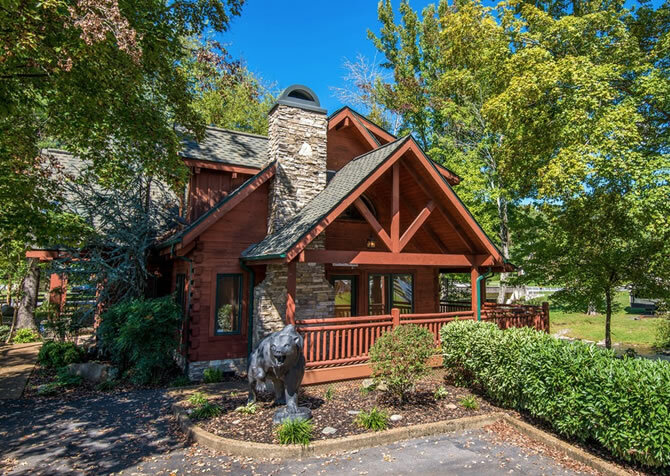 With the feel of home, Smoky Mountain Retreat invites you to unwind, let your troubles go, and spend quality time with the ones you love most. This 1-bedroom, 2-bathroom cabin boasts a queen-size bed in the loft area, an inviting fireplace in the living room, flatscreen TVs, a soothing outdoor hot tub, community pool access, and lovely views of nature. Plus, you'll have lots of conveniences you enjoy at home. 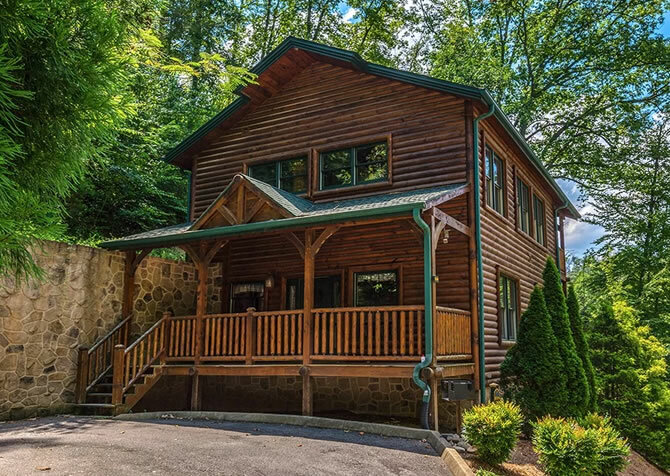 Embark on a pampered retreat and vacation to this 2- bedroom Gatlinburg cabin rental, surrounded by the lush woods of the Great Smoky Mountains. A large screened-in porch offers shade and an escape from it all with its hot tub and patio furniture - perfect for quiet nights. 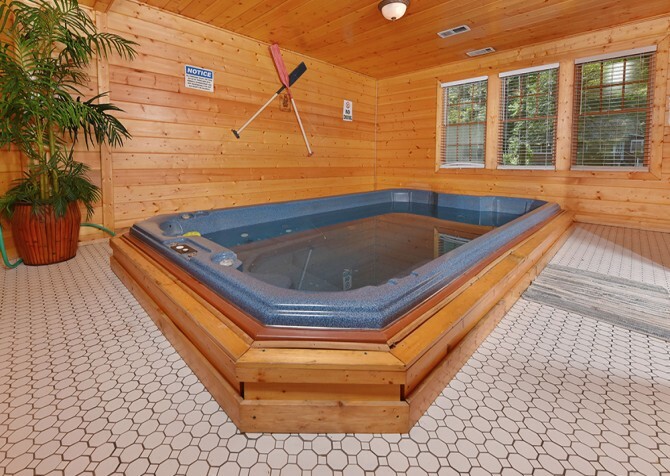 You will love the large ceramic shower, community pool access, and convenient location of this charming cabin rental. This beautiful 1-bedroom cabin for 4 allows guests to sink into rustic Smoky Mountain living while enjoying relaxing amenities like a large indoor jetted tub, outdoor hot tub, breathtaking views from the spacious deck, and a large flatscreen TV to enjoy your favorite movies from home each night by the fire after fun-filled days in downtown Pigeon Forge. 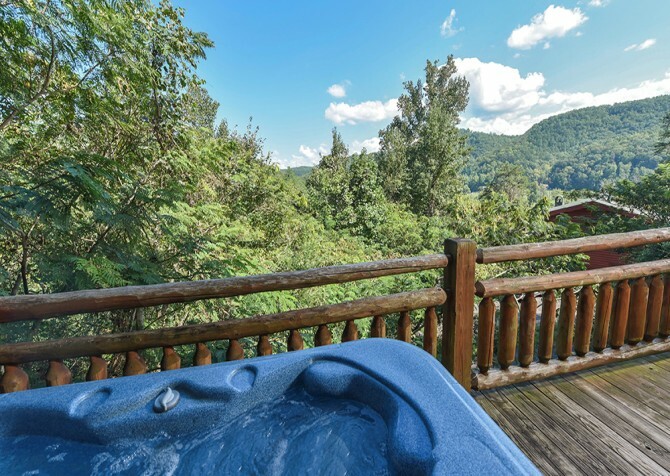 Amenities at this cozy 2-bedroom, 2-bathroom Pigeon Forge cabin include a soothing hot tub, a relaxing indoor jetted tub, pool table, and gas grill for cookouts on nice nights. The location makes it peaceful enough for a romantic weekend, and the amenities and location near downtown make it fun and convenient enough for a group of 6! It even has a 6-foot scrapbook table, which is perfect for putting together those vacation memories. 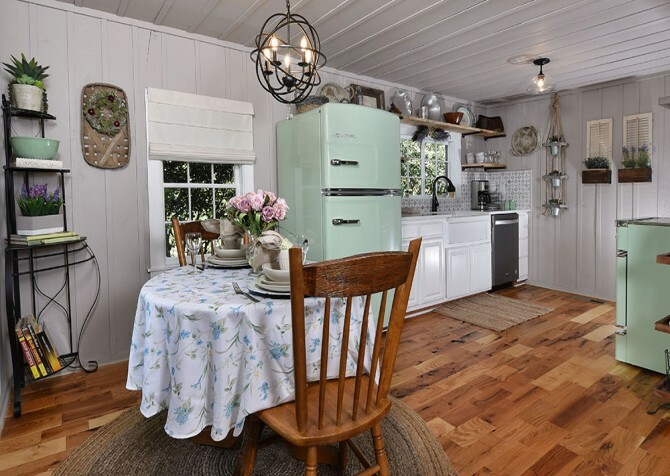 With 2 bedrooms, 2 bathrooms, a fully equipped kitchen, and charming outdoor spaces, Moonglow is the cabin of choice for a vacationing group of 6 in Pigeon Forge. 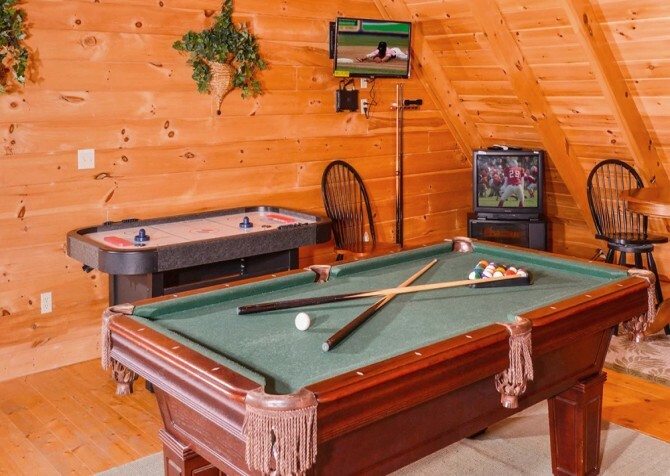 The rec room features a foosball table, arcade unit, board games, and TV to keep everyone entertained, and the bubbly hot tub and gorgeous mountain views provide immeasurable relaxation. With only one level, perfect for unloading heavy suitcases or those with mobility restrictions, the fun and funky A Wild Hare is equal parts modern and mountain. Relax in the indoor jetted tub, soak in the outdoor hot tub, or play at the community pool – just a mile from downtown Sevierville and not far from Pigeon Forge! 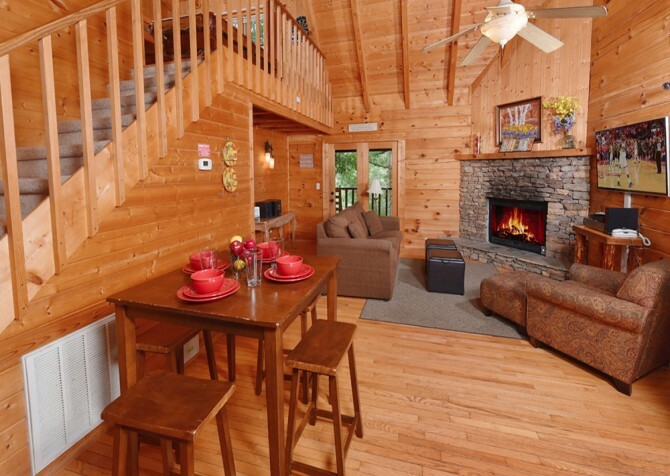 Quiet and relaxing, Jud's Place is ideal for a peaceful week in the Smokies. The 2-bedroom, 2-bathroom cabin can sleep up to 6 guests, making it great for couples' retreats, a weekend with friends, or family vacations. Jud's Place keeps you entertained with a game room with pool table and TV. 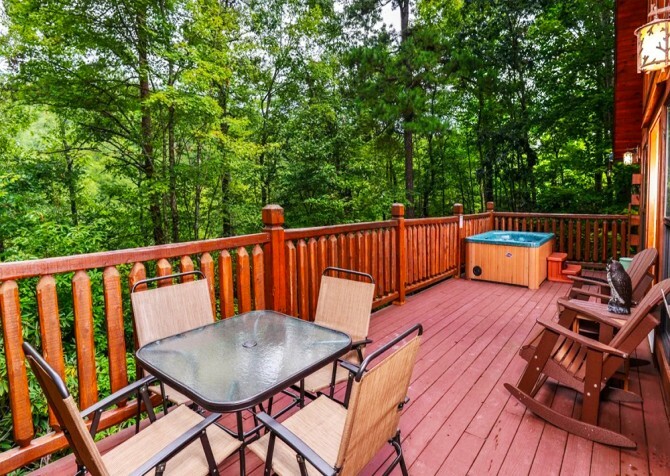 This stylish cabin with lush wooded views is located in the Cobbly Nob Resort in Gatlinburg. Slip away to the Great Smoky Mountains for a memorable stay in this 1-bedroom charmer that perfectly blends vintage charm, modern amenities, and cozy mountain style. From the vintage-style refrigerator and claw-foot tub to the big screen TVs and the hot tub overlooking the water, On River Time has all the ingredients for a wonderful retreat for 2. Nestled in a Smoky Mountain forest, Close Beside Me provides the essential quiet necessary to get away from it all. 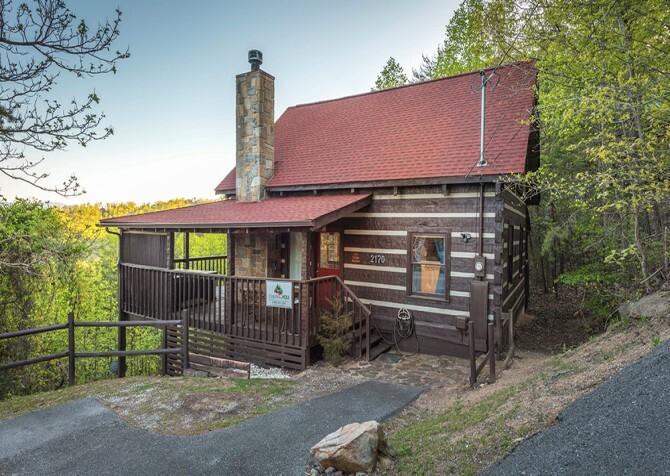 Prepare meals in the fully equipped kitchen, dine with friends outdoors, enjoy dips in the steamy hot tub, sip marshmallow-filled cocoa by the fireplace, and cuddle with your beloved in the king-size bed at this 2-bedroom, 2-bathroom cabin for 8. Featuring a spacious deck with a porch swing and an outdoor hot tub — perfect for relaxing after an exciting day in town — Little Bearadise, a 1-bedroom, 1-bathroom cabin for 4, is a great choice for a small family trip or a romantic getaway. Watch feature films on the flatscreen TV, snuggle by the gas fireplace, and hit the hay in the comfy queen-size bed. 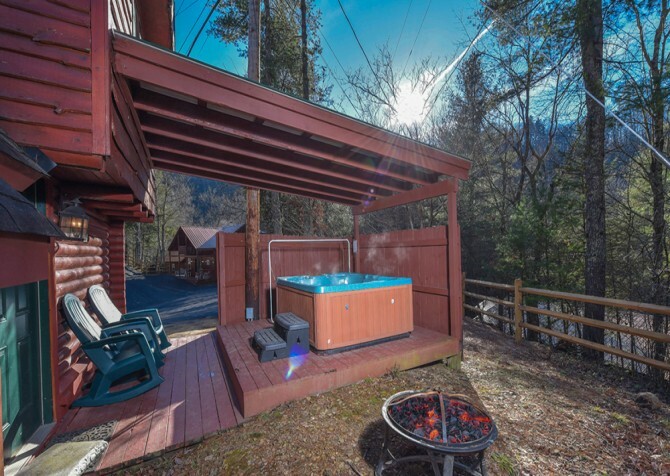 Boasting an indoor 8' x 15' swim spa and an ideal location near downtown Gatlinburg, this 1-bedroom, 1-bathroom pet-friendly cabin is perfect for guests wanting to check out the attractions and restaurants in town. Comforts from home include a full kitchen, high-speed internet, and washer and dryer, while vacation amenities such as a pool table, charcoal grill, and a waterfront location make it ideal for a getaway. 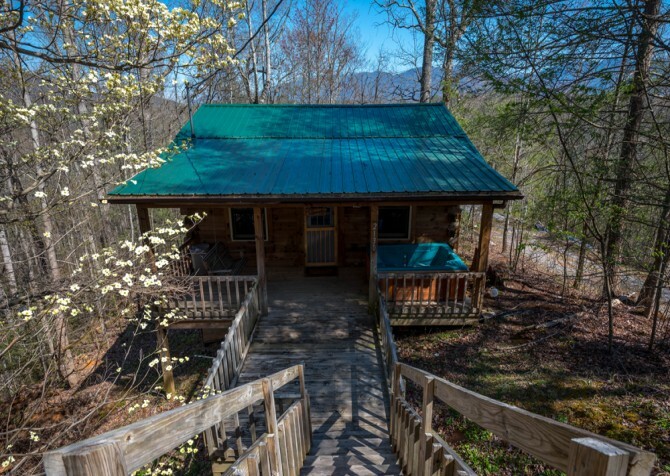 A fantastic view of Mount LeConte from the hot tub and covered deck are what this lovely cabin has to offer. 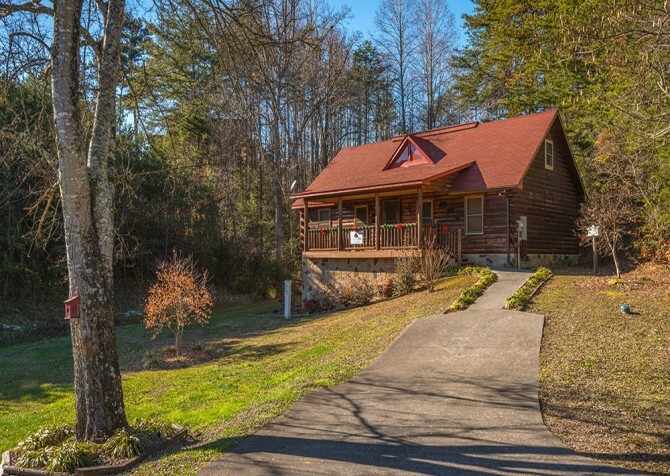 One bedroom and two bathrooms, this Pigeon Forge cabin is pet friendly and peaceful. 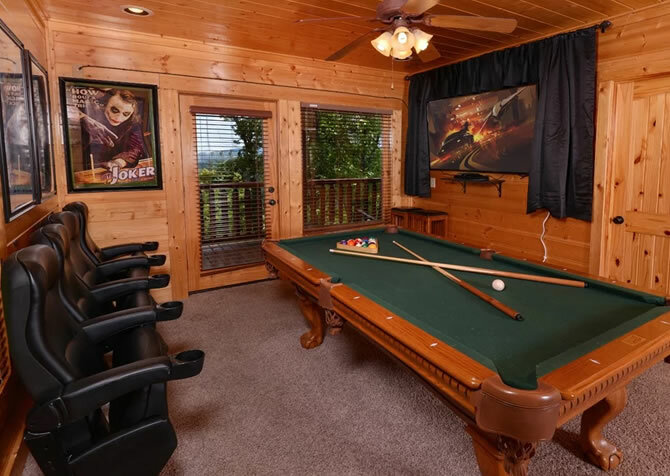 The wood-burning fireplace offers an authentic mountain feel, while the air hockey and foosball tables give you many ways to entertain yourself in the Smokies. 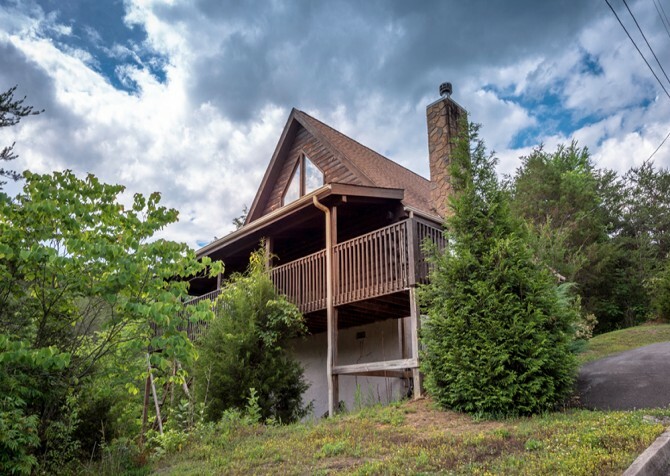 For couples, families, or a small group of friends looking for a quiet, cozy place to stay in the Smokies, A Wildflower Retreat is a great match for YOU. 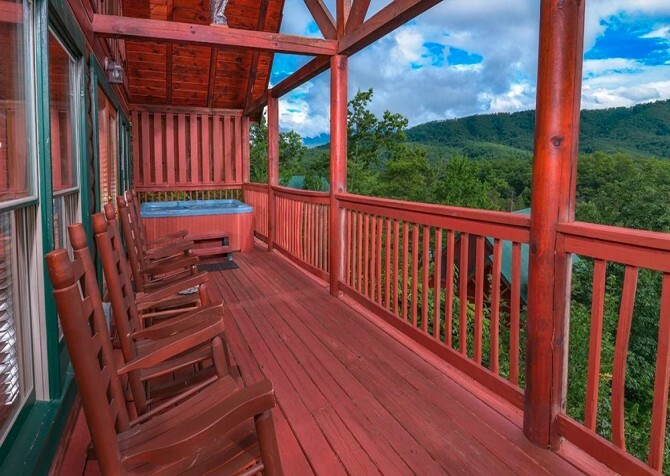 Enjoy sleeping space for 8, seasonal mountain views of the Smokies, hot tub soaks outdoors, and a long list of amenities in this 1-bedroom, 1.5-bathroom, pet-friendly cabin in Gatlinburg, TN! 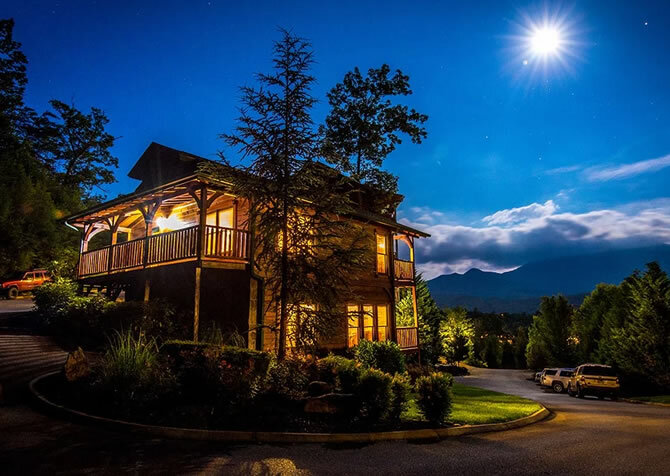 Camp David offers the best of both worlds on a Pigeon Forge vacation: a location near downtown and stunning mountain views. Spend days playing at Dollywood before heading back for pool, coffee on the deck, board games, movie nights by the fire, and more! 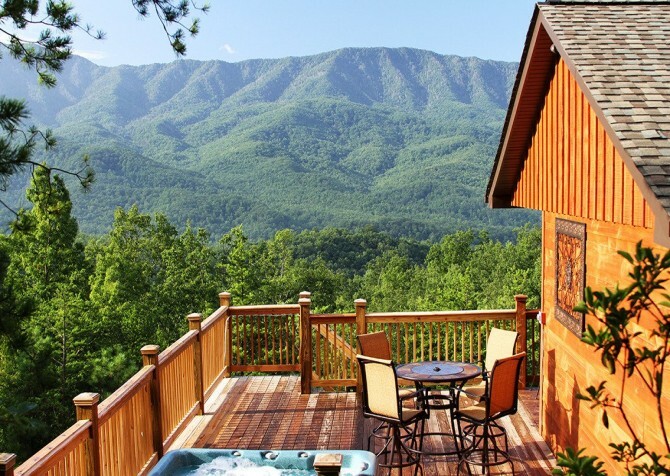 Take a look at the majestic Smoky Mountains from this cabin’s point of view — literally! 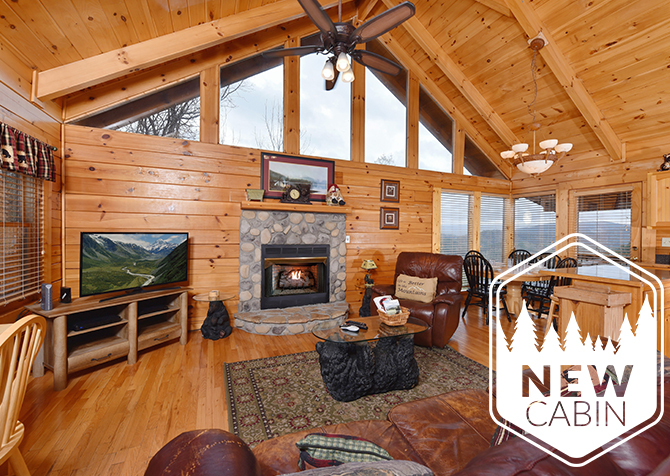 From mountain views and a private indoor pool with fun water features and stone surround to beautiful interiors and lots of amenities and conveniences, this cabin for 12 was made for relaxing family vacations and fun group getaways! 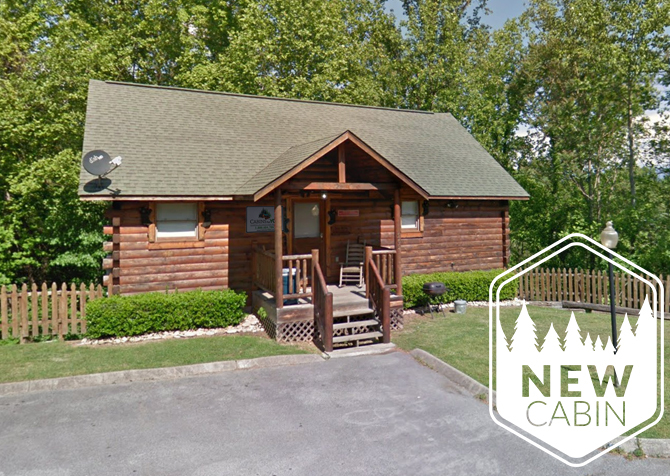 Located in Pigeon Forge, Sweet Annie is a 2-bedroom, 2-bathroom cabin with lots of conveniences and amenities. Families and friends will love the comfortable spaces and entertainment offered in the cabin. 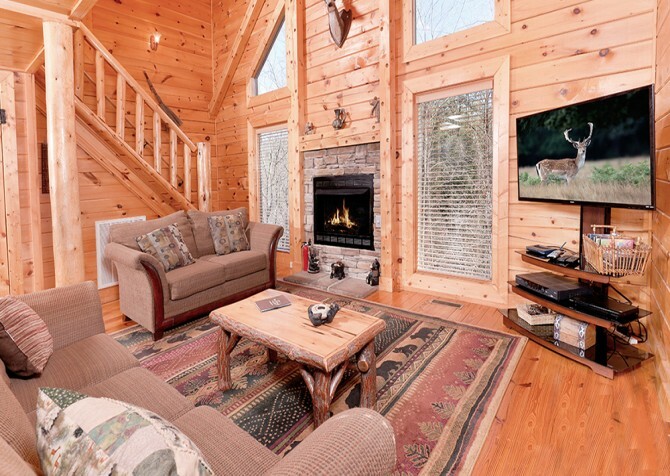 This charming cabin features a 42-inch flatscreen TV, wireless internet, washer and dryer, outdoor hot tub, flat driveway, gas fireplace, queen-size beds, and TVs and DVD players in each bedroom! 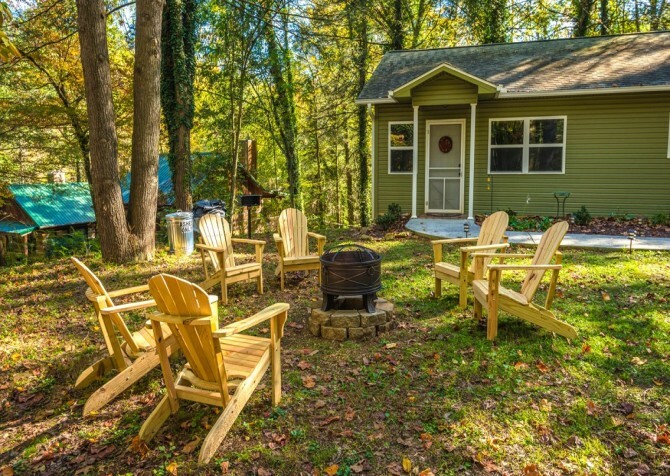 This lovely 2-bedroom, 2-bathroom cabin for up to 5 guests is the perfect escape to enjoy the peaceful tranquility of the Smoky Mountains while soaking in the outdoor hot tub and lounging on the glider seating on the back deck after exploring downtown Pigeon Forge, only a few miles away. Plus, there’s a 60-inch flatscreen in the home theater in addition to fun arcade games! 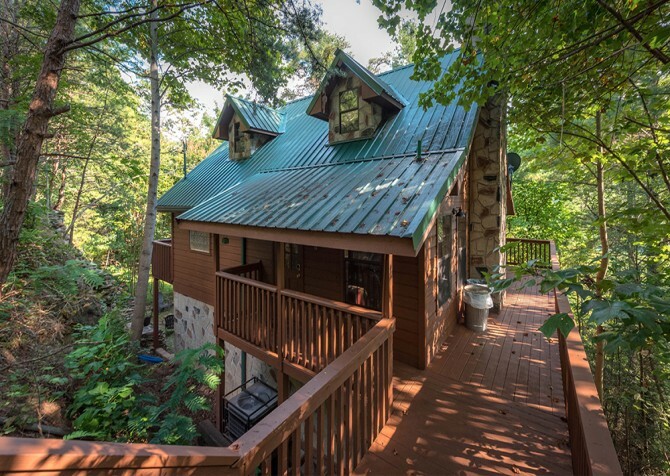 A 2-bedroom cabin with a loft, Simone's Cottage is within walking distance of the attractions and restaurants of downtown Gatlinburg. Modern amenities offer convenience while mountain décor keeps it cozy and inviting. 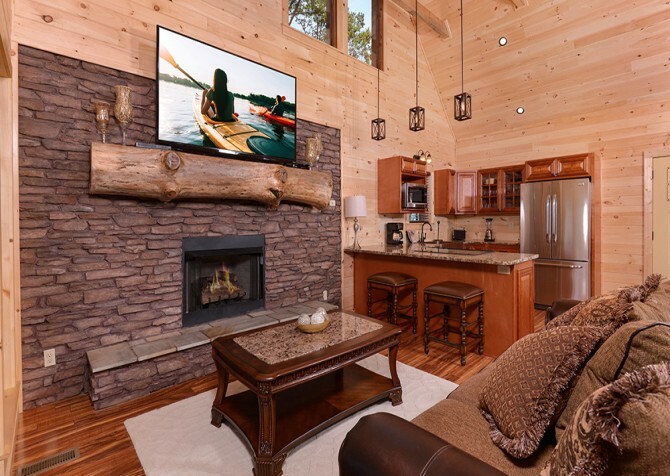 The cabin sleeps up to 8 guests and has a big screen TV, wireless internet, and a large swim spa outside! Just a short drive from the heart of downtown Gatlinburg, Sweet Temptations is convenient to dozens of attractions, restaurants, and shops, but also semi-private. 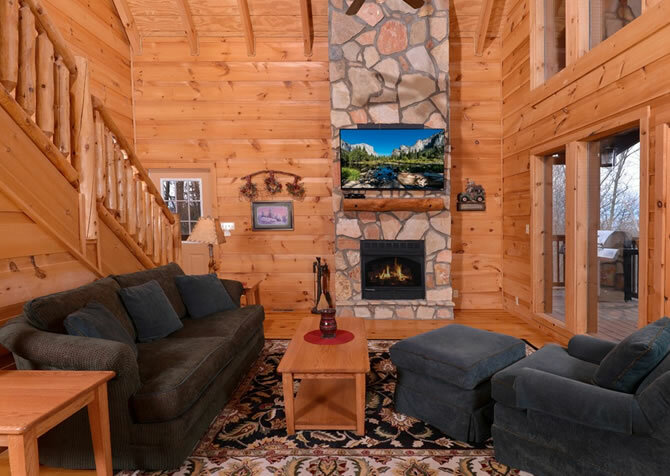 Take in the wooded and mountain views (in fall and winter) from the rocking chairs or hot tub on the deck, unwind by the fire as you watch the big screen TV, or play a few rounds on the pool table or foosball table when you don't want to get out of the cabin. 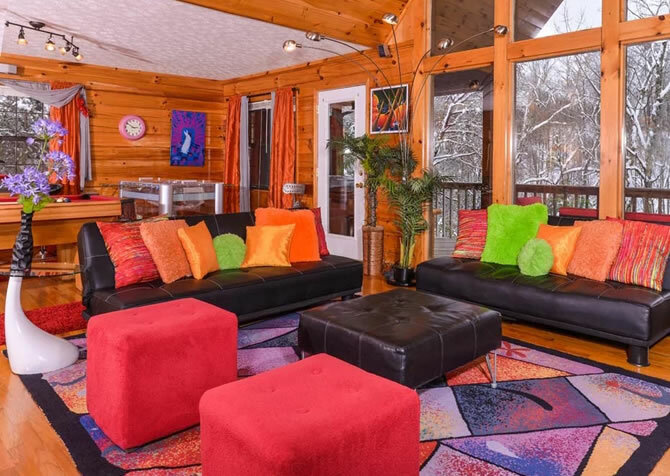 Your Pigeon Forge vacation just got a little brighter with the 2-bedroom cabin Dancing with the Stars. 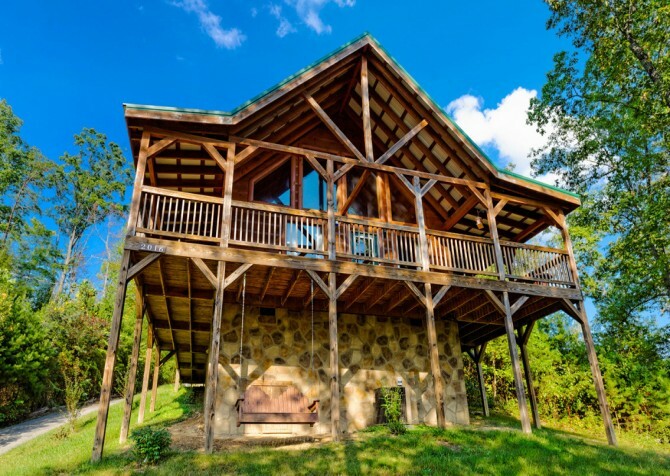 Enjoy everything this 9-person cabin has to offer, including a screened-in outdoor hot tub and a multifunctional rec space with multiple game tables. Invite your friends or bring your family for a Pigeon Forge getaway set in the Smoky Mountain hills. 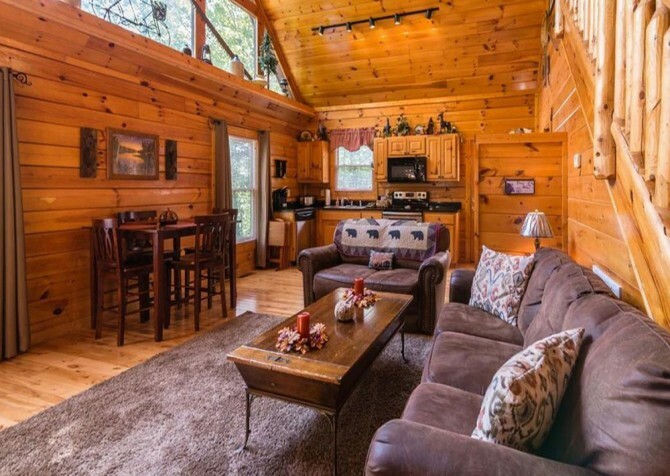 Sleeping up to 6 guests, Smoky Oak Retreat is a cozy 2-bedroom, 2-bathroom cabin rental in Gatlinburg, TN — great for family vacays or trips with friends. Splash at the community pool in summer, work out at the gym, hang out at the clubhouse, and more in the resort. 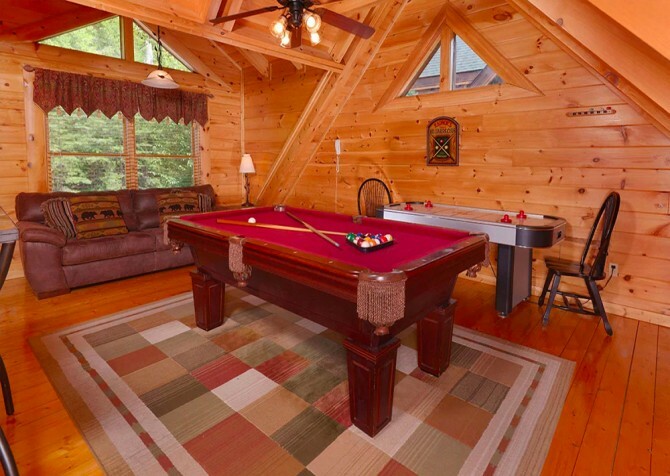 Plus, you’ll find a hot tub, 50-inch TVs, a pool table, and an indoor jetted tub for fun and relaxation at the cabin. 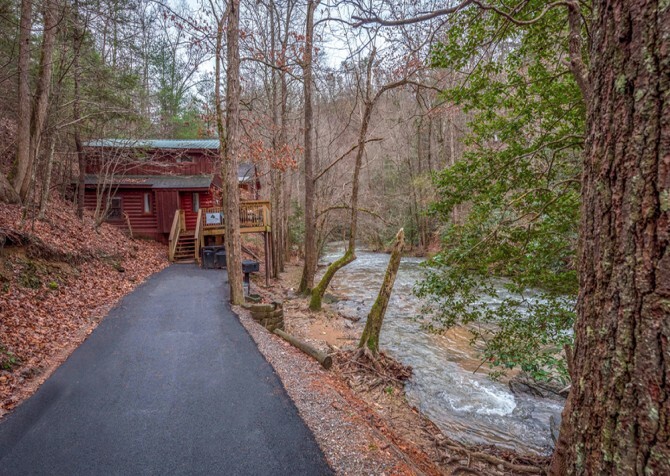 In Keaton’s Bear Cove Creek Retreat rests a 1-bedroom retreat for 2, perfect for a weekend away or a week-long stay in the Smokies. Keaton’s Knotty Hideaway offers more than just a peaceful setting. Unwind in the steam hot tub outdoors, lounge in the living room with big screen TV, and sleep in a comfy queen-size bed. 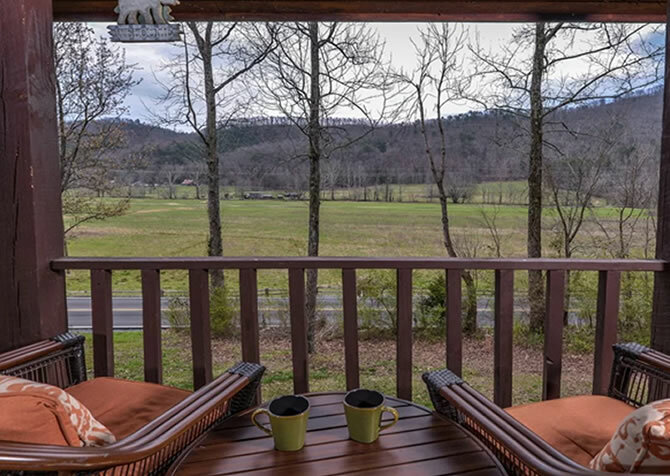 This pet-friendly 2 bedroom cabin rental is located less than 4 miles from the downtown Pigeon Forge Parkway, so it's easy to check out The Island, play at Dollywood, shop, and dine. Spend your time playing on one of the several game tables, including pool, and air hockey. Lounge on the covered deck and outdoor furniture or take a trip to the community indoor or outdoor pool. Bring the family or a small group of friends for a fun time in the Smoky Mountains at Knotty Desire. This cabin for 6 features all your favorite amenities, from a soothing outdoor hot tub to community pool access to a pool table. 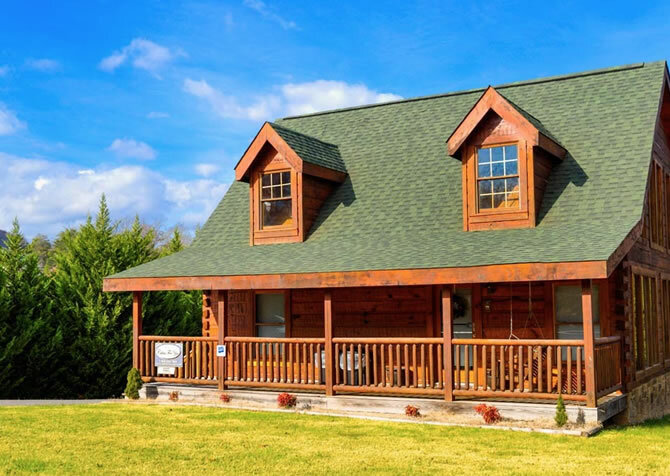 With private porches and comfortable sleeping spaces, Knotty Desire is sure to be the cozy, good-time cabin you’re looking for in Pigeon Forge. 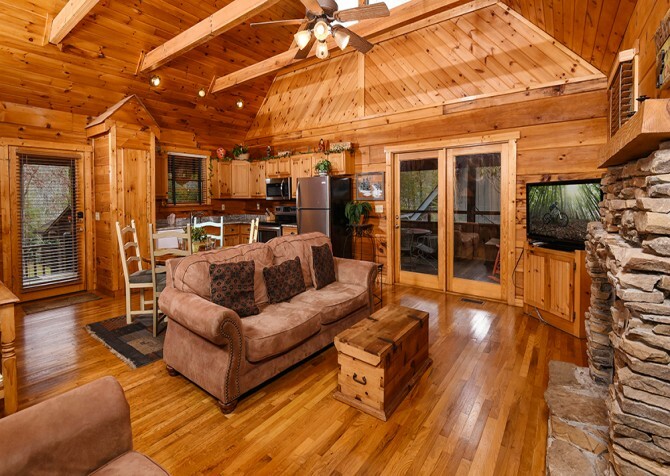 The perfect size for a couple's getaway, anniversary, or honeymoon, Little Smoky Dream is a 1-bedroom, 2 ½-bathroom cabin about 12 miles from downtown Pigeon Forge. 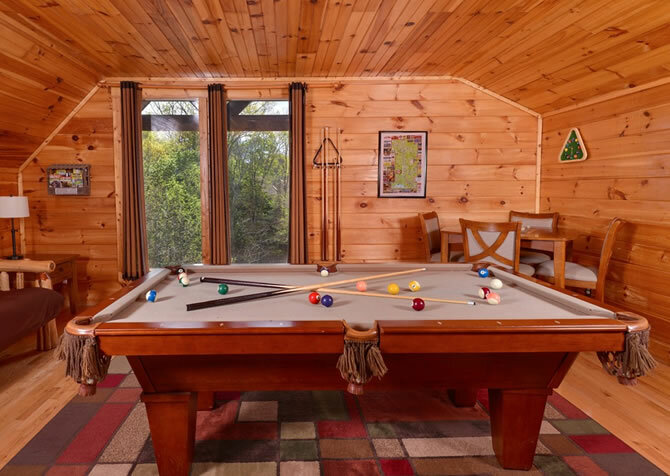 For a fun and relaxing stay, this cozy cabin offers a fun pool table, a relaxing hot tub, mountain views, and a semi-private location for peace. Whether inside or outside, you will feel comfortable and at ease here. 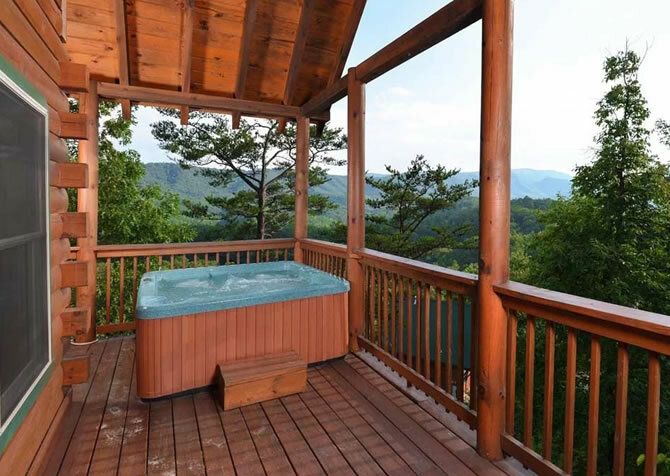 Enjoy evening soaks in the outdoor hot tub, midnight snacks from the fully equipped kitchen, gaming fun on the Xbox, and soothing wooded views from the screened-in porch at Bear View, a 2-bedroom, 2-bathroom cabin in Pigeon Forge. Perfect for a family getaway or trip with friends, this home sleeps up to 6 guests comfortably with 2 king-size beds and a twin bunk. A beautiful 2-bedroom cabin, Hillside Escape offer the comforts of home and the amenities of a vacation rental. Charming mountain decor makes the cabin feel like home, and the fully-equipped kitchen makes it easy to prepare meals in the cabin. The rec room has a futon, pool table, stereo, and TV. Outside, the cabin features wooded views, a covered hot tub, a gas grill, and a dining table. Semi-private with 1 bedroom plus a loft, 1 bathroom, a fully equipped kitchen, a cozy living room with big screen TV, a rec room with game tables, and a screened-in deck with a bubbly hot tub, this Smoky Mountain home for 10 makes it easy to Think a Little Less and focus on your relaxing couples’ retreat, family vacation, or getaway with friends. From movies to arcade games or foosball and pool, there’s plenty to do in Hard to Leave. Enjoy a couple’s retreat while relaxing in the hot tub at night or gather in the cozy dining room for dinner in the cabin with friends and family. 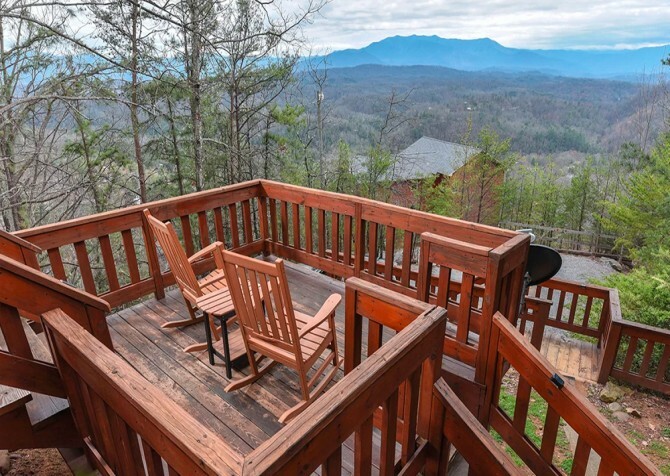 Add great mountain views, a wraparound deck where you can get fresh air, and lots of homey conveniences for stay in the Great Smoky Mountains you won't soon forget! Soak in your wooded views from the large covered porch or read a book in the sunroom when you stay at this 2-bedroom retreat. 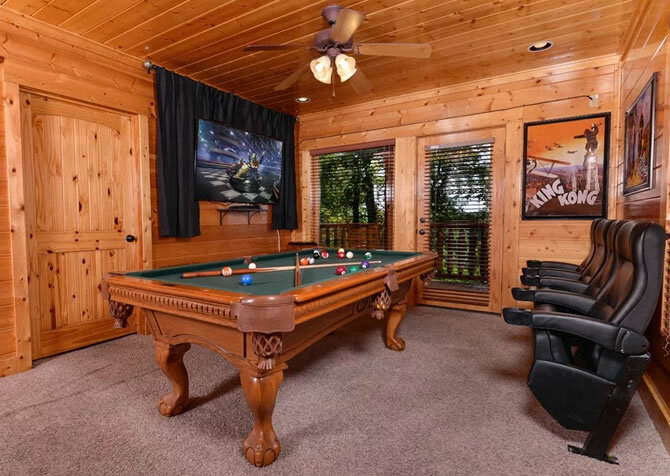 This Gatlinburg cabin rental features pool access and lots of amenities, including internet access, pool and air hockey tables, a Blu-ray player, a soothing hot tub, a full kitchen, and a gas fireplace. Relax and play in this fun getaway! 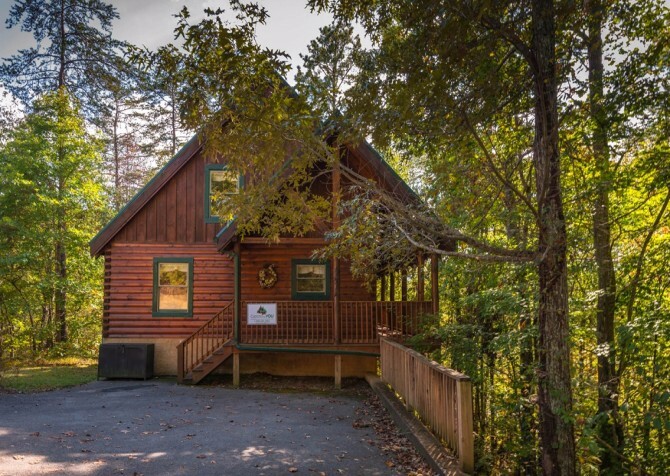 With 2 bedrooms, 2 bathrooms, and room for 6 guests, this secluded cabin in Pigeon Forge is perfect for family trips or getaways with friends. Featuring a TV in every bedroom, an outdoor hot tub, a fully equipped kitchen, and a gas fireplace, Bear Crossing is the perfect place to unwind. 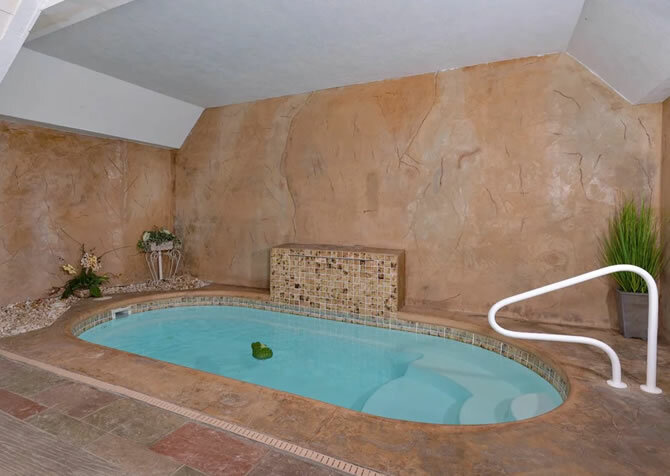 Spend evenings soaking in the hot tub and nights enjoying the flatscreen TV. 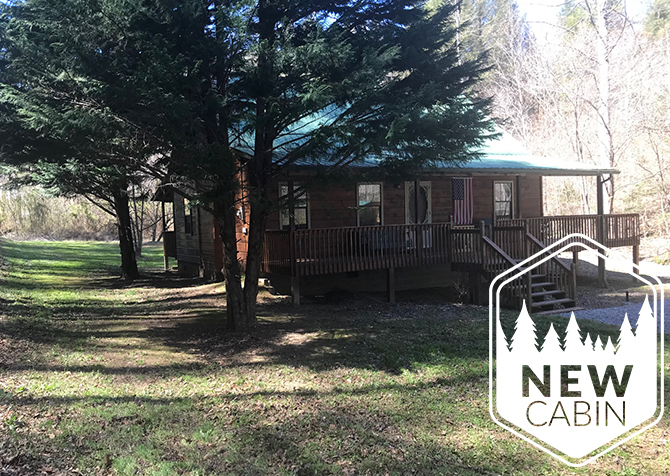 A small family or a group of friends will feel right at home on the Pigeon River in this charming 2-bedroom, 2-bathroom cabin. 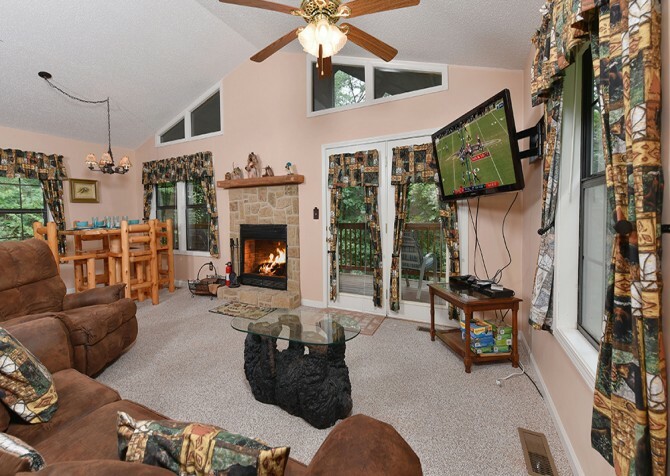 After fun-filled days, watch movies together on the huge flatscreen TV mounted above the fireplace for a cozy movie night or kick back around a crackling fire in the fire pit of the outdoor seating area by the river in the evenings! Days at Come Back Inn are a blend of fun and relaxation. Unwind in the hot tub on the screened-in deck after a busy day downtown, play pool in your rec room on a quiet afternoon, head to the community pool to splash around in summer months, kick back in front of the big screen TV in the living room, or just stay connected with the Wi-Fi in the cabin. 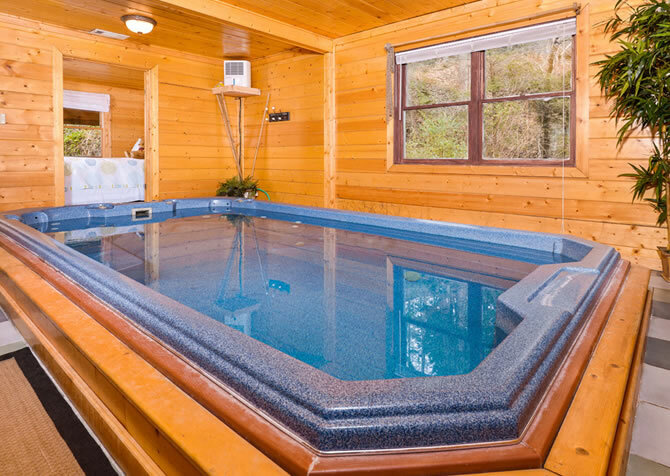 The highlight of this cozy Gatlinburg cabin, an indoor 8' x 15' swim spa can be utilized year-round. The luxuries of a vacation rental – a pool table, hot tub, wide screen TV, and gas fireplace – are paired with the feeling of home. Made just for 2, it's perfect for a romantic getaway or honeymoon. It's also within walking distance of all downtown Gatlinburg has to offer. 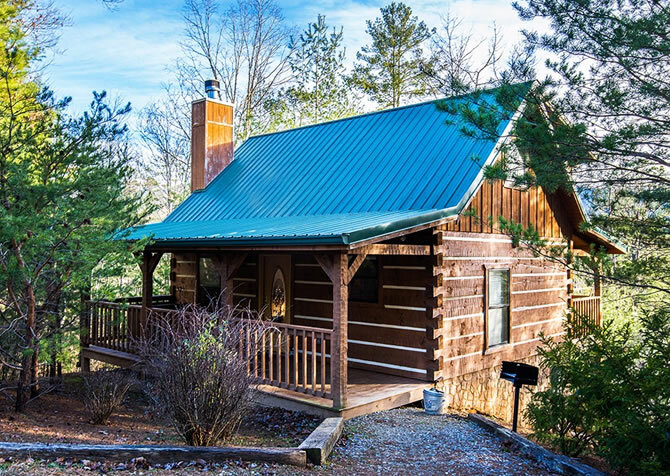 Less than 10 miles from downtown Pigeon Forge, this charming 2-bedroom cabin features 3 bathrooms, a comfy king-size bed, wooded and mountain views, Wi-Fi, an indoor jetted tub, an inviting fireplace, and beautiful décor. Plus, there's a rec room for game tournaments and a theater room for movie night! With room for 8, this cabin is ideal for a romantic getaway. Kiss The Moon offers 2 bedrooms, 3 bathrooms, and a large loft with 3 beds, providing comfortable accommodations for up to 8 guests. Enjoy all this plus a wraparound porch, a semi-private lot surrounded by trees, and a spacious interior with a traditional log cabin design. For small groups and families, Kiss The Moon is a great rental choice in the Smoky Mountain hills. While Little Bear Cabin is close to downtown attractions, the privacy and amenities make staying in fun, too. 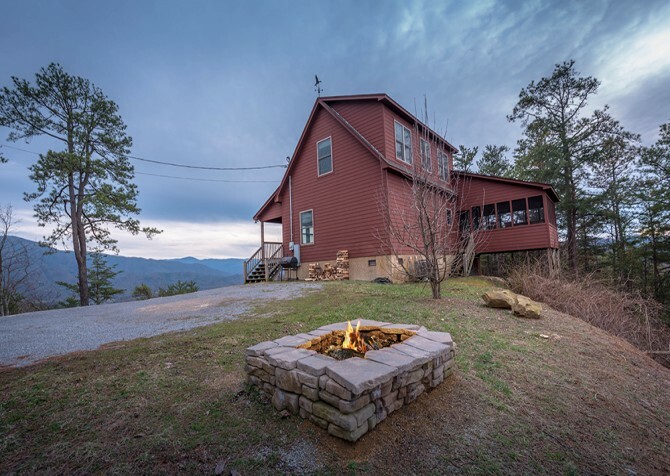 Play games with the kids in the spacious living room, relax with friends in the outdoor hot tub, shoot some pool, sit down for a romantic dinner, or sip coffee on the front porch as you breathe in fresh mountain air and enjoy wooded surroundings before your day gets started. Sip tea on the cushioned deck furniture, get toasty by the outdoor electric fireplace, relax in the private indoor pool, and snuggle up with your sweetheart in the king-size bed at the Edge of Paradise. Complete with a fully equipped kitchen and marvelous master suite, this 1-bedroom, 1-bathroom cabin sleeps 2 and boasts a spectacular view! Featuring 2 big screen TVs, a steamy hot tub facing majestic mountain views, a rec room with air hockey and pool tables, 2 master suites with king-size beds and jetted tubs, a gas grill, high-speed Wi-Fi, a fully equipped kitchen, 2 full bathrooms, and room for 8 guests, Absolutely Perfect makes a wonderful Pigeon Forge escape for family and friends. Get ready to relax, unwind, and de-stress with A Mountain Hibernation in the Smokies! This studio-style cabin for 4 offers 1 bedroom, 1 bathroom, a fully equipped kitchen, a big screen TV with Blu-ray and DVD players, a stacked-stone fireplace, an arcade unit, an outdoor hot tub with a mounted flatscreen TV, plus gorgeous mountain views through floor-to-ceiling windows. Swim year-round in your private indoor pool, play pool and arcade games, whip up meals in your own fully equipped kitchen, unwind in the rocking chairs or at the dining table on the deck, or cozy up in your king-size bed after a busy day playing in the Great Smoky Mountains National Park or shopping and eating in downtown Gatlinburg. At the cabin and downtown, there's always something to do! Not far from the fun of downtown Pigeon Forge, Memory Keeper offers a relaxing place for family and friends after busy days hiking, shopping, eating, and exploring. Play pool, foosball, darts, and arcade games; break out the board games for family game night; make meals in a fully equipped kitchen; and relax in an indoor sauna, jetted tub, and outdoor hot tub! Enjoy outdoor meals, soaking in the hot tub, rocking as you look out over the trees, cozying up in front of a fireplace and big screen TV, relaxing in your jetted tub, and making meals with family and friends in this beautifully designed cabin. You’ll also have a community fire pit and nearby hiking trails for more outdoor fun! An outdoor entertainment center complete with a fireplace and flatscreen TV, a hot tub with mountain views, a pool table, and a private indoor pool—these are some of the amenities you’ll enjoy inside Splash of Romance! This 2-person cabin is ideal for couples looking for a modern mountain cabin that’s close to downtown. You'll have plenty to do at the cabin, and you can take a short drive to explore the area! 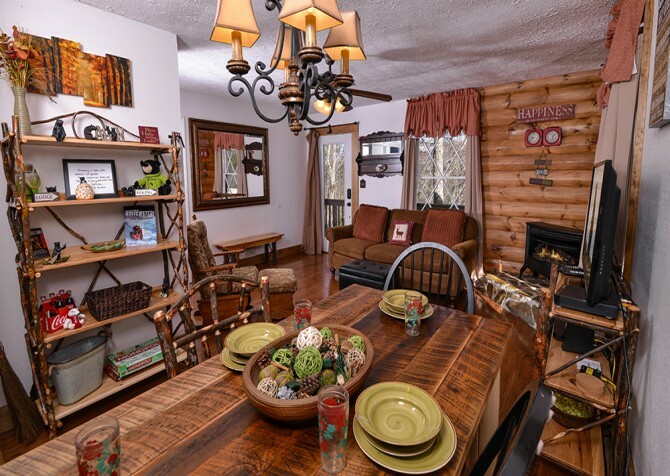 This bright and welcoming Pigeon Forge cabin is eagerly awaiting your arrival with family and friends. With 1-bedroom + loft and 2 bathrooms, everyone will be comfortable, while the living area invites your family in for a pleasant night. 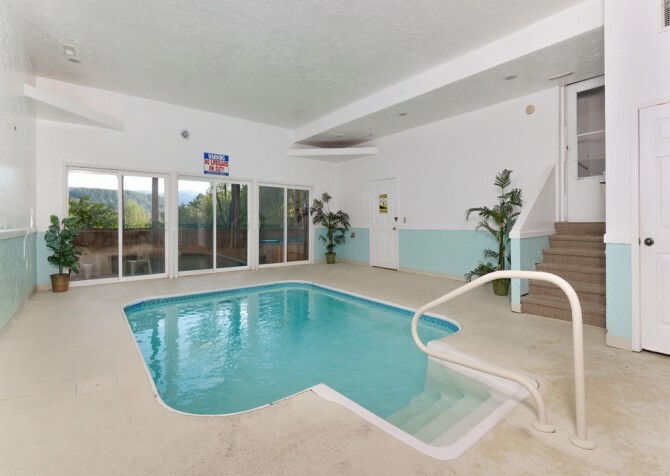 Take advantage of the wireless internet, soak in the hot tub, make meals in your full kitchen, or play on the pool table during your vacation to the Smoky Mountains. 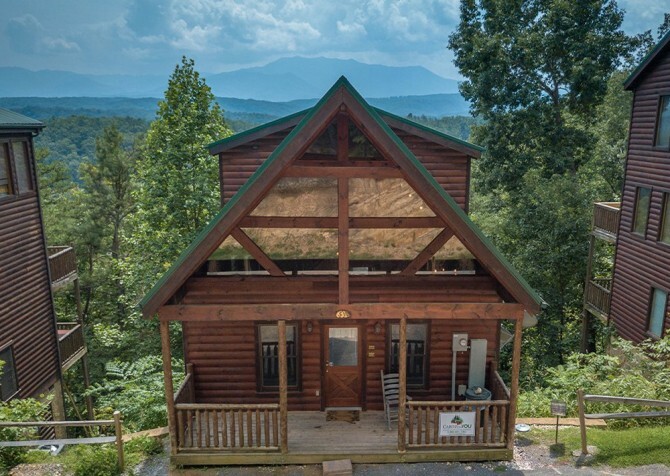 Bring your closest friends or escape to the mountains with family in this beautiful 2-bedroom cabin with enough space for up to 6 guests and pets to kick back with breath-taking mountain views from the rocking chairs and the bubbling outdoor hot tub. 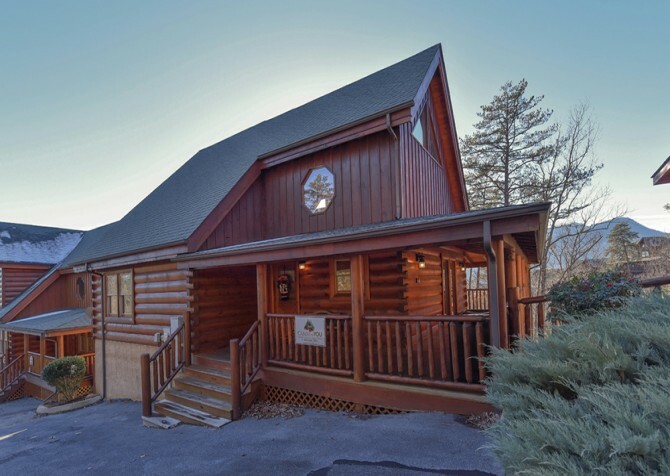 This Pigeon Forge cabin is tucked away from it all and offers a spacious layout for you and your family to enjoy. A paved driveway and a large porch, both covered and uncovered, will greet you when arrive. Challenge your friends to a round of pool or foosball before settling in to the porch swing to watch the sunset. A fireplace (gas) and hot tub add the finishing touches to this cabin rental. With a semi-private location and a variety amenities, Alone at Last could be your getaway from the fast-paced rhythm of everyday life. A large indoor jetted tub and walk-in 2-person shower are just two of the things that make this cabin a soothing and relaxing getaway. After a long day, don't forget to take a break in the indoor sauna that is definitely going to leave you refreshed and rejuvenated! 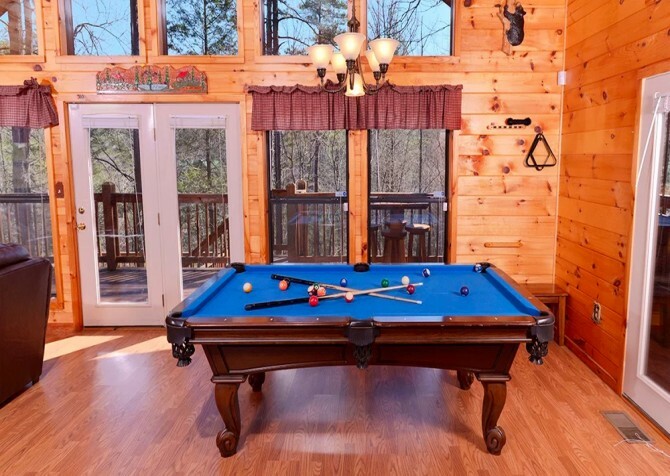 Speaking of the finer things in life, Timber Toy is a great choice if you’re in the market for a cozy cabin with valley views, a game-filled rec room, an outdoor hot tub, and a private home theater for a group of 4 in Pigeon Forge. 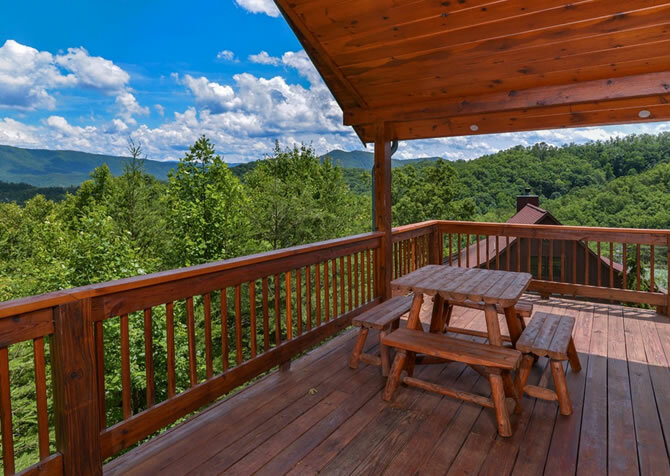 With 1 bedrooms + a loft, 1 bathroom, a fully equipped kitchen, spacious deck, and complimentary Wi-Fi, you’ll feel at home in the Smokies in no time! 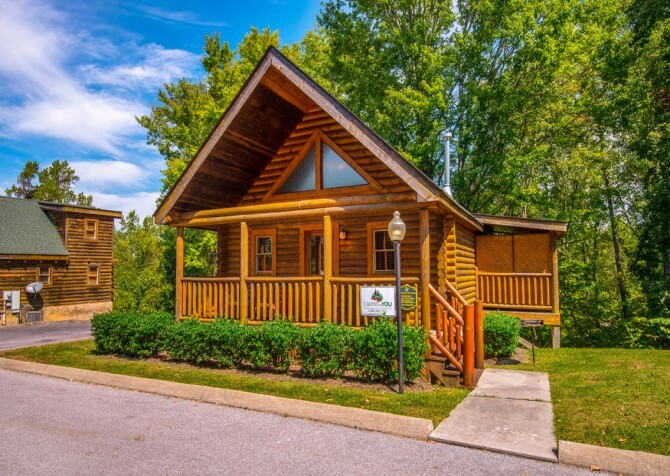 Located in Bear Creek Crossing Resort in Pigeon Forge, Oh Yea is a 2-bedroom pet-friendly cabin that can accommodate up to 8 guests. Boasting plenty of games, including an air hockey table, pool table, and foosball table, it has enough to entertain a group. Use the high-speed internet to check out upcoming local events or curl up in front of the big screen TV and watch movies on the DVD player. 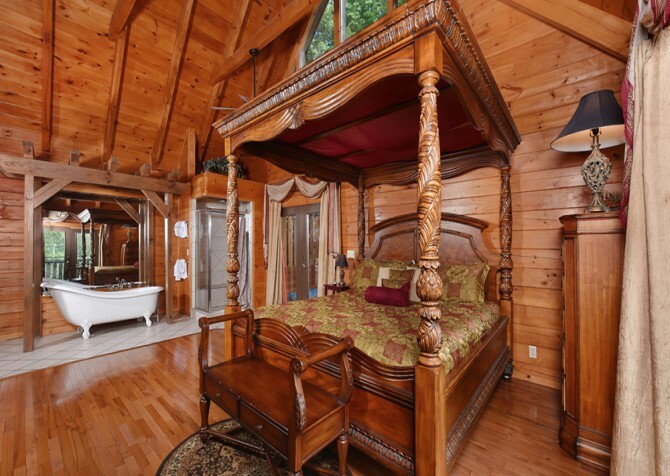 Enjoy a dreamy retreat when you vacation to this luxurious Gatlinburg cabin rental. The bedroom of this log cabin features an open style with claw-foot tub and large shower with a double-sided gas fireplace that reaches into the living area. 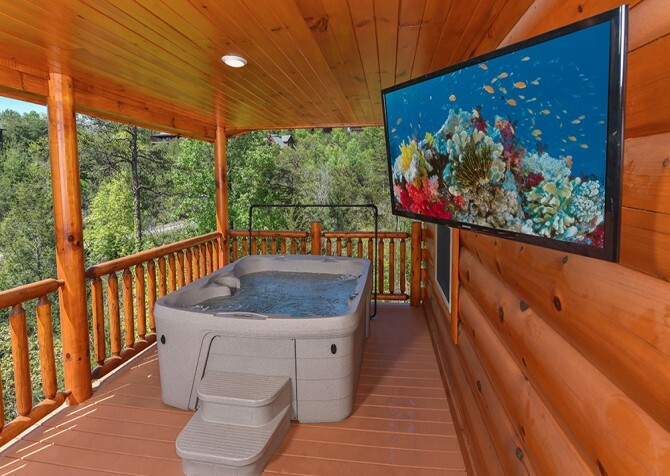 A recessed hot tub and pool access make this cabin a great choice no matter the time of year, and extras like a theater room with 65-inch smart TV take it over the top! 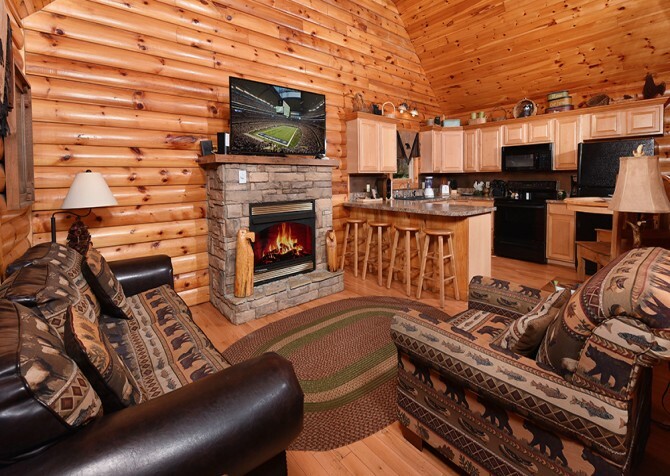 Stay entertained with a Blu-ray player and big screen TVs, relax with a jetted tub, hot tub, and tree-studded views, and feel like you’re at home with a full kitchen and cozy living room where you can hang out with family and friends in this new-in-2017 cabin equidistant from Gatlinburg and Pigeon Forge. Nestled in the Goose Creek Resort, this 2-bedroom cabin boasts a semi-private location that will help you relax and escape from your day-to-day life. Pet friendly, this cabin also features a private screened-in porch with a hot tub and deck furniture. 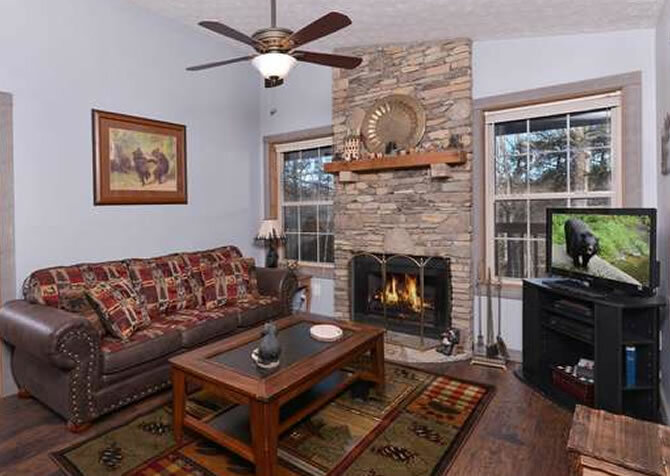 About 5 miles from downtown Pigeon Forge, you can enjoy the city life and get the full cabin experience with a warm fireplace and a woodsy view. 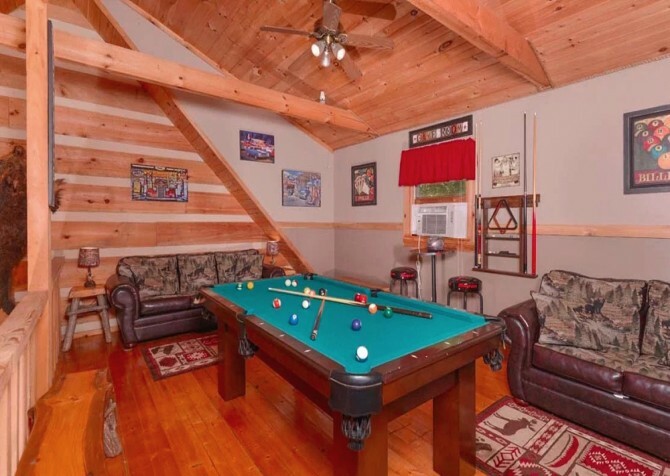 This 1-bedroom +loft Pigeon Forge cabin rental with room for 6 caters to relaxation and fun for families and friends, with a private sauna, arcade games and a pool table, community pool access, wireless internet, and much more. And located in the Bear Creek Crossing Resort, it's just minutes from the attractions, shops, and restaurants along the Parkway downtown! Enjoy a 12-mile distance between you and the busyness of downtown at Serenity’s Clear View. 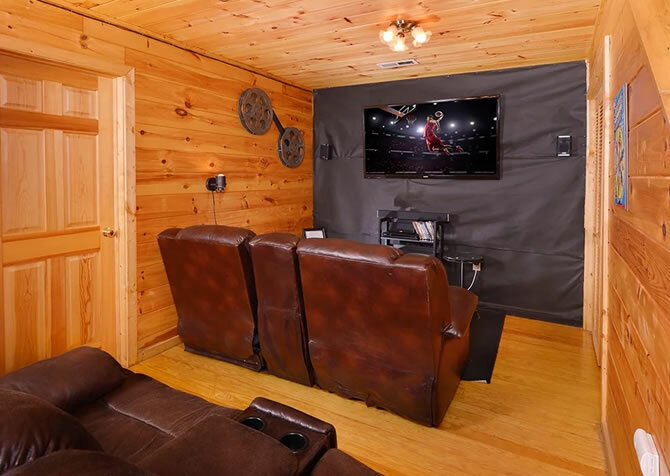 This 5-person cabin features an indoor jetted tub, and outdoor hot tub, along with a game room, big screen TV and Blu-ray player, and rocking chair porch. 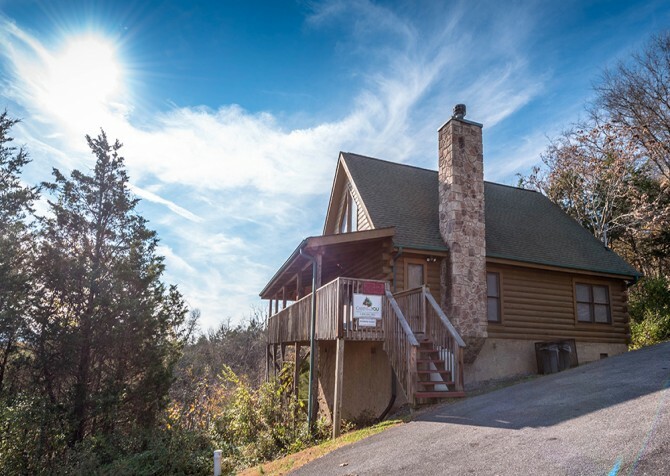 The mountain views and semi-private location make this cabin great for relaxing getaways to Pigeon Forge. 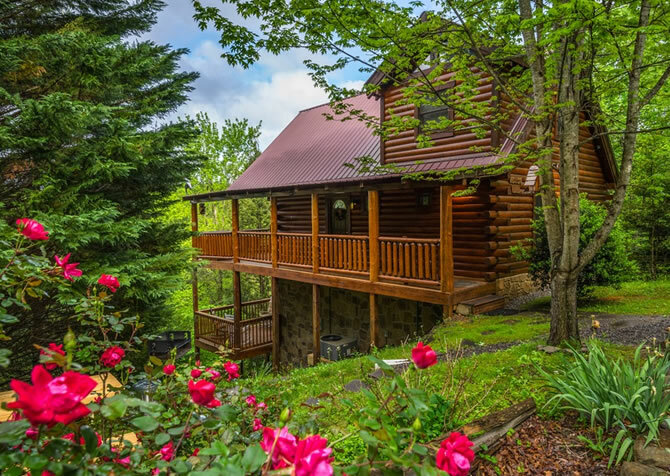 Offering a joyous stay for 6 in the Smoky Mountains, Bear Footin’ is a 2-bedroom, 2-bathroom cabin in a valley area of Pigeon Forge. Cozy up to a warm fire in the living room, take a well-deserved nap on the king-size bed, bake cookies in the oven, pop popcorn in the microwave for movie night on the flatscreen TV, lounge at the community pool, and school your friends in a rambunctious round of pool! 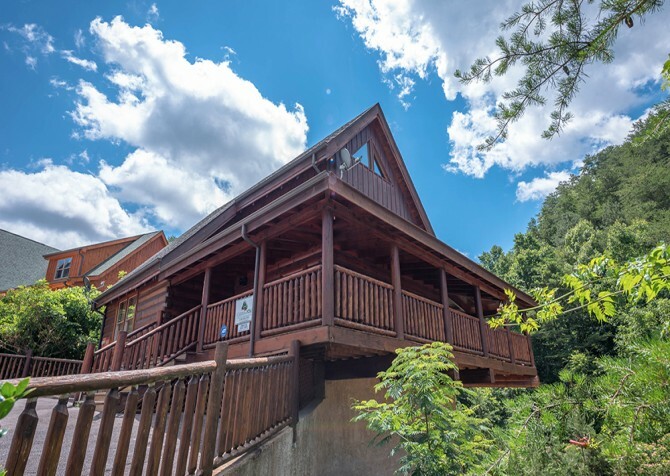 This 2-bedroom cabin is the perfect balance for your Smoky Mountain getaway, with all the allure of downtown attractions and a secluded location! 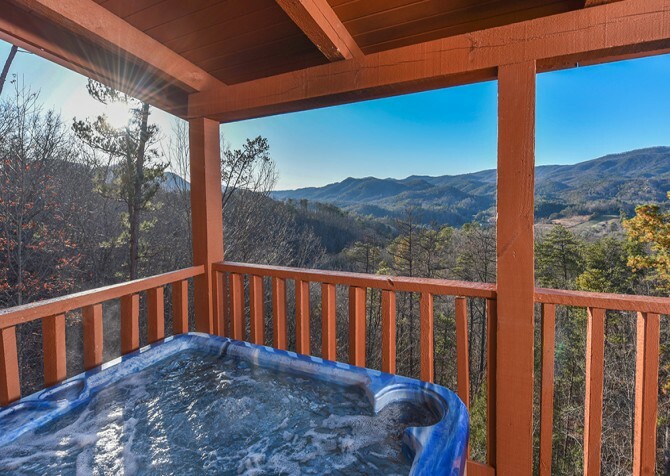 Take a relaxing bath in the indoor jetted tub after a full day of hiking in the Great Smoky Mountains National Park or enjoy your morning coffee in a rocking chair on the back porch with splendid views of mountain skyline. 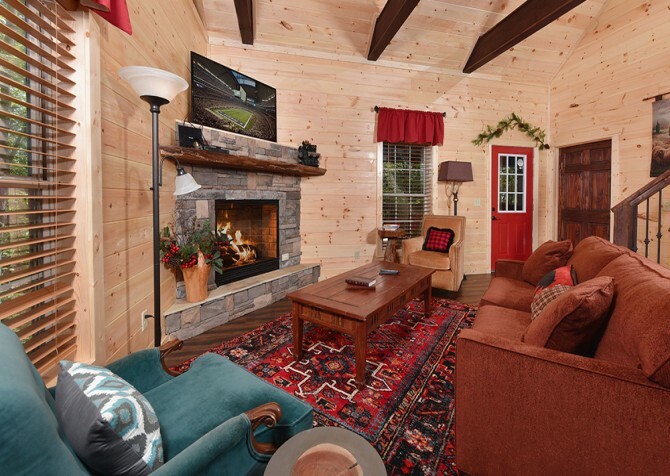 Cozy up in this 2-bedroom cabin for 5, where you'll find comfortable furnishings, board games, a DVD player for movie night, an outdoor hot tub, and a fully equipped kitchen that's fit for game-day snacks and in-cabin meals! Get away for a romantic weekend at this classic log cabin. 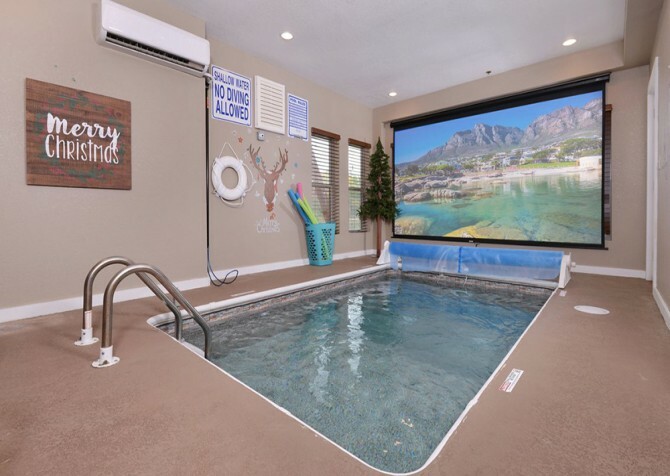 Mountain decor creates a soothing atmosphere; a pool table, foosball table, and air hockey table provide fun; and an indoor jetted tub offers tranquility. Kick up your feet on the porch swing, star gaze while sitting in the hot tub, or have a romantic candlelit dinner. 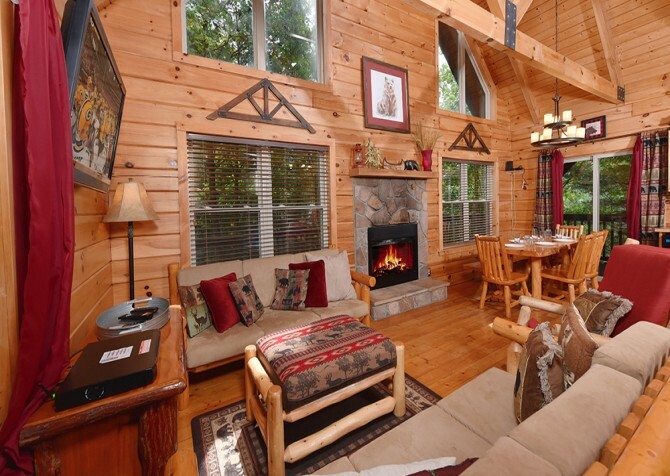 Located in Gatlinburg, Sweet Pickins is a beautiful and cozy retreat. This 1-bedroom, 1-bathroom cabin with room to sleep up to 4 features an air hockey table, a hot tub and dining table on the screened-in porch, a comfortable king-size bed, plush sofas, and gorgeous wood interiors. It's perfectly sized for a honeymoon, anniversary, or small family getaway in the mountains. With room for 4 guests and a cozy queen-size bed, Sweet Fantasy is the perfect size for a couple's weekend or a small family vacation full of fun and relaxation. It's less than 8 miles from downtown and offers plenty of amenities. Play a few rounds on the pool and foosball tables, watch the big screen TV, or soothe tired muscles after a long day in the outdoor hot tub. 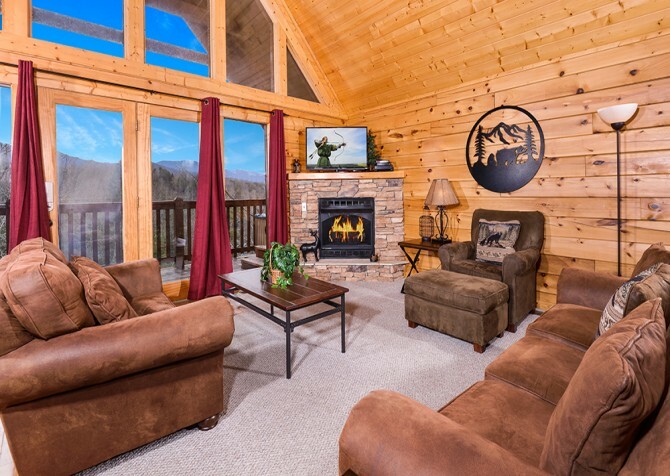 Designed with luxury in mind, this one bedroom cabin features a magnificent view of the Great Smoky Mountains. 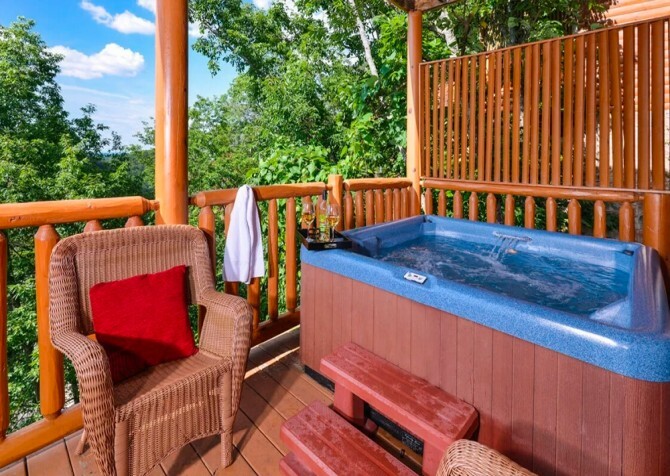 Soak in your view from the comfort of the outdoor furniture or hot tub. Large windows throughout the home frame your view from every angle. This cabin offers access to both the community pool and golf course and features several game tables for your entertainment. 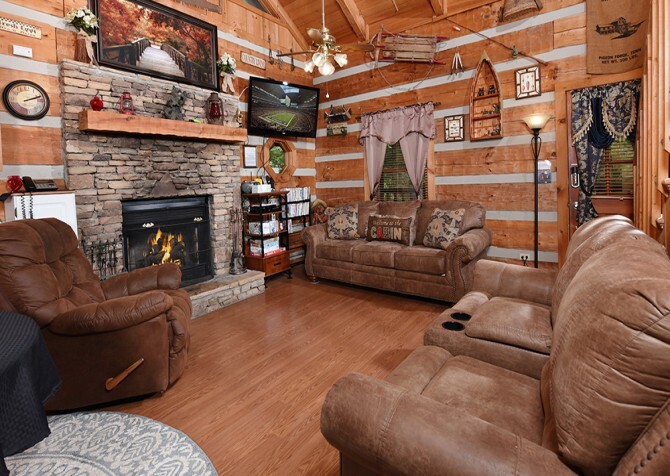 Great for family getaways and weekends with friends, this cozy cabin among the trees of Pigeon Forge offers entertainment inside and relaxing amenities outside. 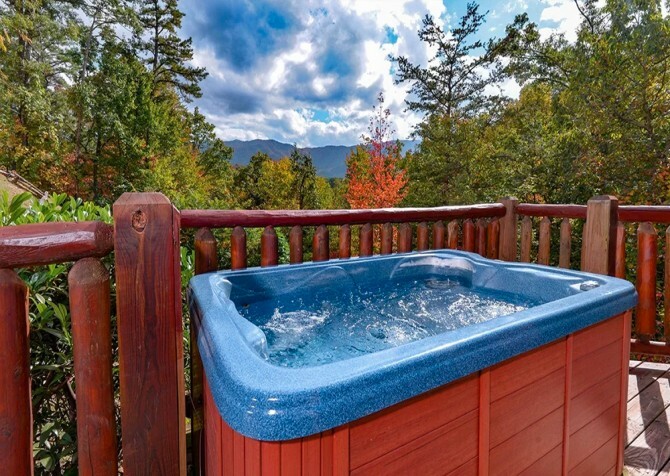 Unwind in the hot tub, soak in the views, or head inside to watch movies, play board games and pool, or make meals in the fully equipped kitchen. It's a fun and comfortable home away from home. 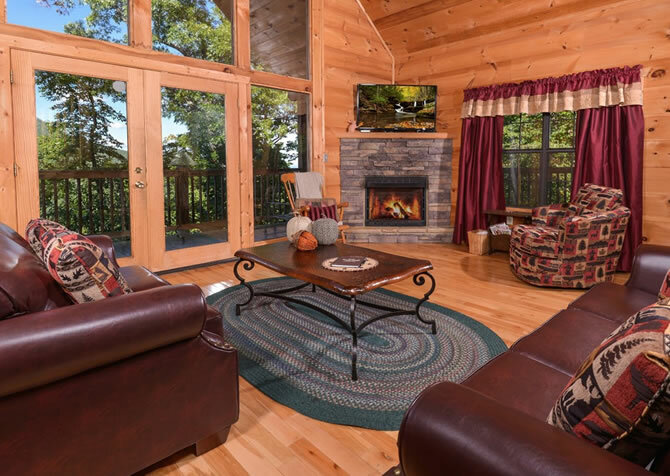 Just over 850 square feet with a fully equipped kitchen, 1.5 bathrooms, a screened-in deck, a cozy living area with a gas fireplace, and a loft bedroom, Tranquility sleeps 4 and is a great choice for a small family getaway or a romantic escape in Pigeon Forge. Watch DVDs on the flatscreen TV, play foosball, soak in the steamy hot tub, and enjoy sweet dreams in the king-size bed. 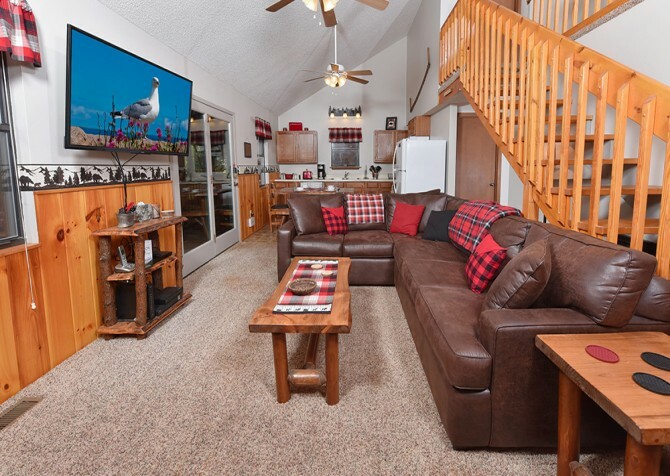 Nestled in the Eagle Springs Resort, this 2-bedroom cabin offers features that you and your vacation group will appreciate. Head to the pool or soak in the hot tub for a refreshing change of pace. A wraparound porch gives you plenty of outdoor space, while the wireless internet allows you to keep up with the outside world or see what's happening downtown. Christmas never ends when you stay at Reindeer Bay, a Pigeon Forge cabin filled with holiday cheer, festive décor, and fun-loving amenities to keep you and yours entertained for days. At 1,800 square feet, up to 9 guests are welcome as space won’t be an issue. Head to the rec room for a game tournament, the private third-floor deck to relax, or the living room for movie night on the flatscreen TV. Enjoy all the comforts of home like high-speed internet, cozy king and queen-size beds, and flatscreen TVs in both rooms at Cozy Cabin. Plus, enjoy great extras like the outdoor hot tub with relaxing wooded views, a stacked-stone fireplace with a 50-inch flatscreen TV with Netflix, a spacious master suite with mountain views, and a pool table to shoot around during lazy afternoons. 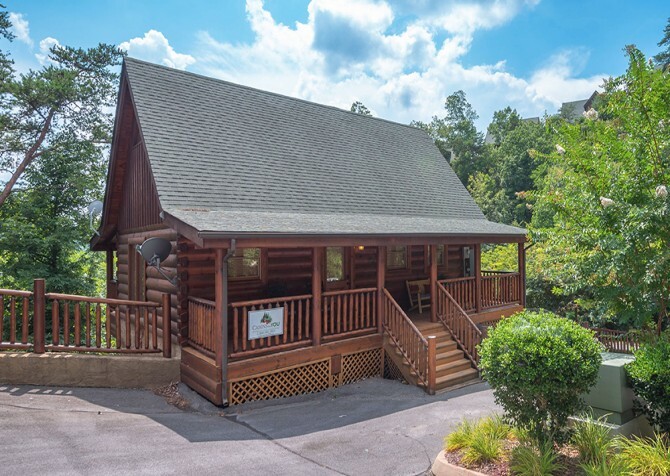 Surrounded by the Smoky Mountain trees, Cuddle Bear offers the perks of staying in the Echota Resort along with easy access to popular attractions. 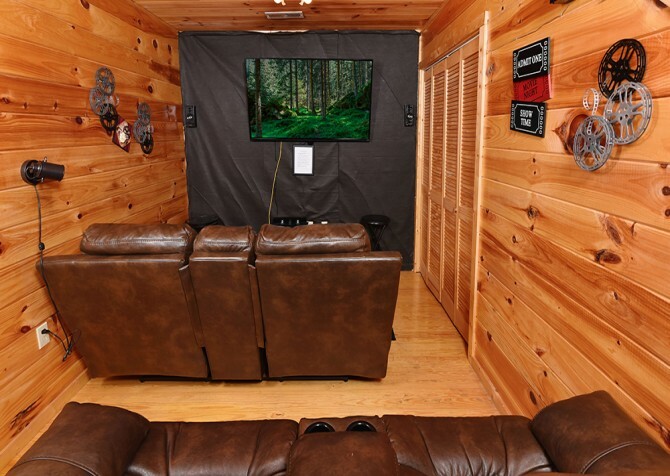 Inside this 1-bedroom cabin for 4, play on the multigame arcade, relax in the jetted tub, or watch a favorite DVD on the big screen TV after a busy day in town. This cabin also offers an outdoor hot tub inside a screened-in porch. Although the private indoor pool with a creek running from the wading pool to the main attraction is the star of this cabin, Saddle Creek’s other amenities are sure to impress. Kids and kids at heart will love shuffleboard and foosball, adults will appreciate the high-speed internet, and everyone will love the Blu-ray player with big screen TV. Perfect for romantic retreats, On the River features tranquil views of the Little Pigeon River, a master suite with a king-size bed and copper tub, a tiled rain shower in the full bath, a big screen TV and stone fireplace in the living room, an outdoor hot tub and rocking chairs on the screened-in deck, and a reading lounge with a mini library. 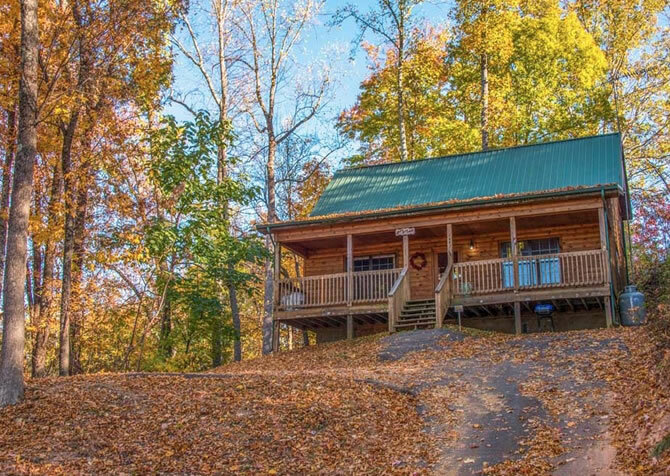 Homelike and pet friendly, this 2-bedroom cabin sleeps 4 guests and is located less than 2 miles from everyone's favorite Pigeon Forge attraction, Dollywood! This cabin features 2 jetted indoor tubs in addition to an outdoor hot tub where you can breathe in the fresh mountain air. 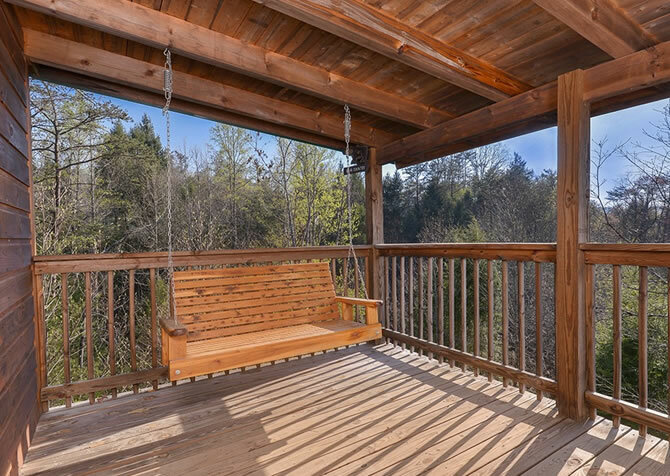 Swing your worries away on the porch swings or prepare a meal in the full and spacious kitchen. 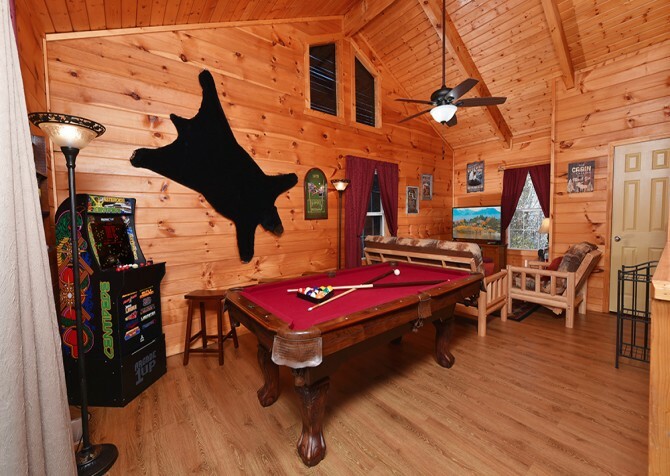 Fun awaits at Keaton's Cozy Cabin, a 2-bedroom + loft cabin in Pigeon Forge with wooded views, an outdoor hot tub, a media room with big screen TV, king-size beds, built-in bunks, and more! Plus, it's pet friendly! 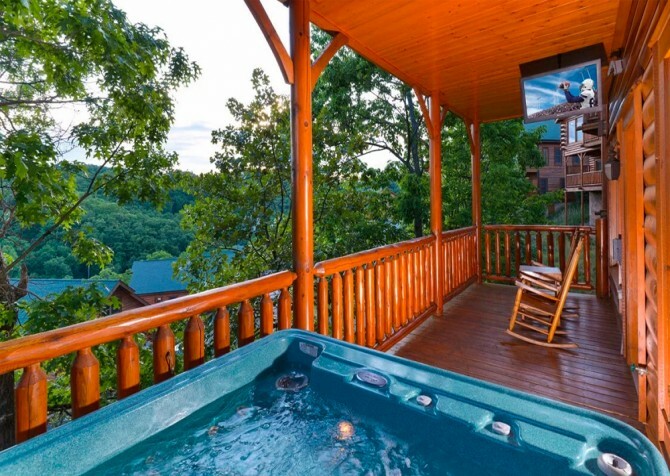 Pool table, outdoor hot tub, porch swing, 3 flatscreen TVs, DVD library, board games, indoor jetted tub, fully equipped kitchen, woodsy views, gas grill, rocking chairs…this Smoky Mountain cabin for 6 isn’t called Easy Livin’ for nothing! 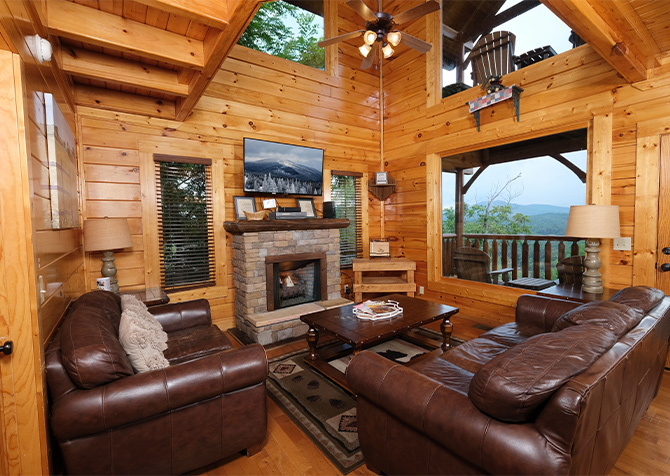 Bring family and friends for a great time in the mountains at this 1-bedroom + loft, 2-bathroom cabin in Pigeon Forge. 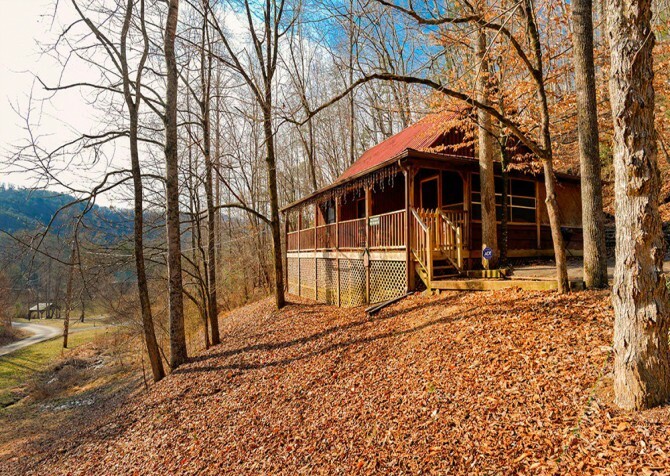 Retreat from your busy life and escape to this semi-private, 2-bedroom Pigeon Forge cabin rental. Fun amenities make it easy to pass the time – play on the air hockey or pool tables. 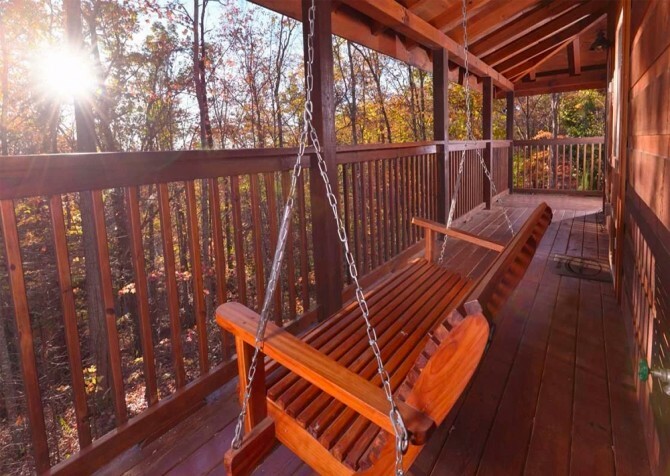 The large covered deck offers a porch swing, hot tub, and rocking chairs to soak in your serene view of the Smoky Mountain forest when you just want to kick back and unwind. 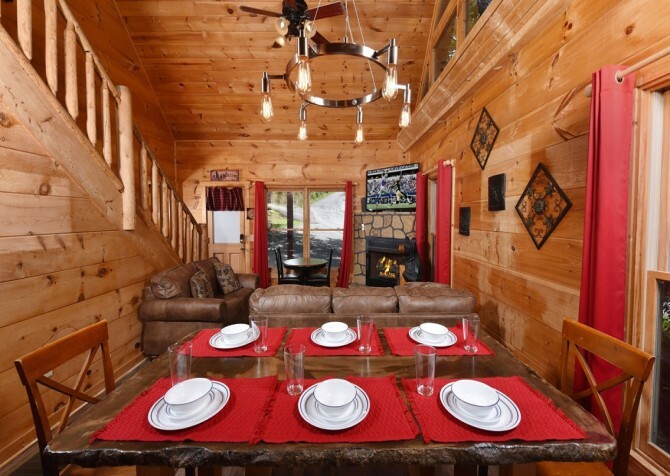 A duplex cabin connected to Legacy Mountain Magic, Legacy Mountain Lazy Bear offers space for 6 on its own or space for up to 12 rented with both sides. Inside, find plenty of amenities for convenience, comfort, and fun! 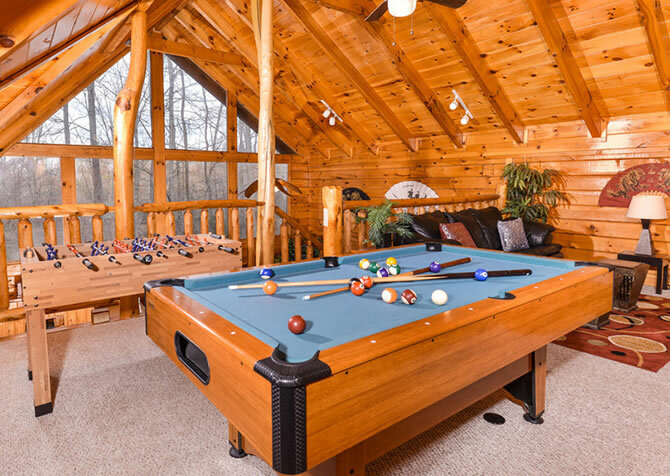 Featuring an outdoor hot tub, multiple big screen TVs, a pool table, arcade game unit, foosball table, fully equipped kitchen, complimentary Wi-Fi, and more, Little Bear Lodge is the perfect Pigeon Forge cabin to keep families and friends entertained. 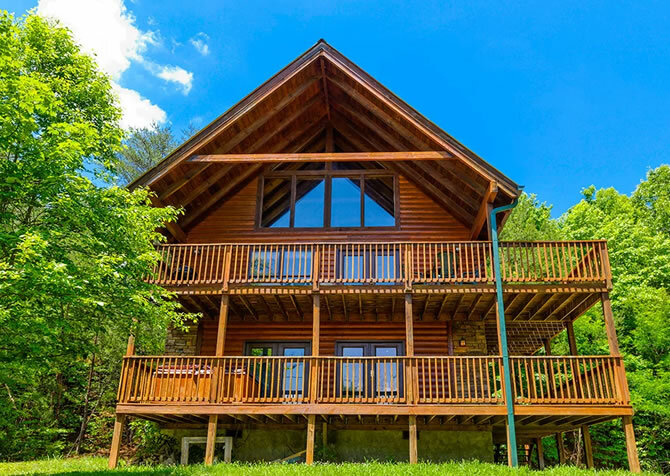 With 2 bedrooms, sleeping accommodations for 10, and 2 full bathrooms, this semi-private abode is ready for your Smoky Mountain vacation. After fun-filled days in downtown Pigeon Forge just a short drive from your secluded Smoky Mountain cabin, hang out in the rec room playing pool and arcade games, sip on ice cold sweet tea on the front porch, watch TV in the privacy of your bedroom at night, or share warm cups of hot cocoa while seated around a romantic fire in the stone fireplace. 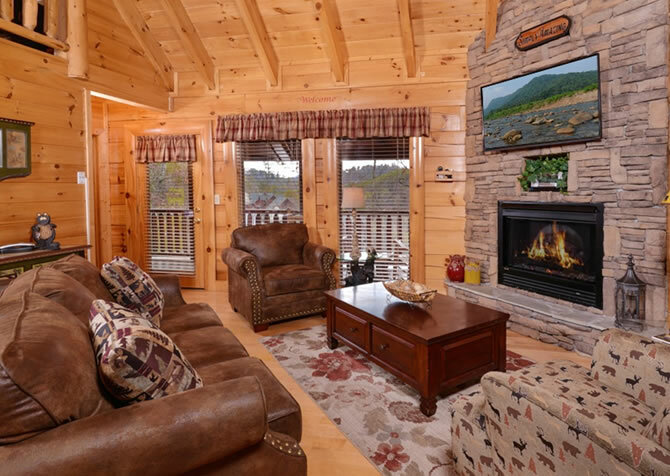 At American Pride, a cozy cabin in Pigeon Forge, you'll have your own beautiful cabin perched atop the hillside and plenty of amenities to keep you feeling at home and comfortable in the mountains. 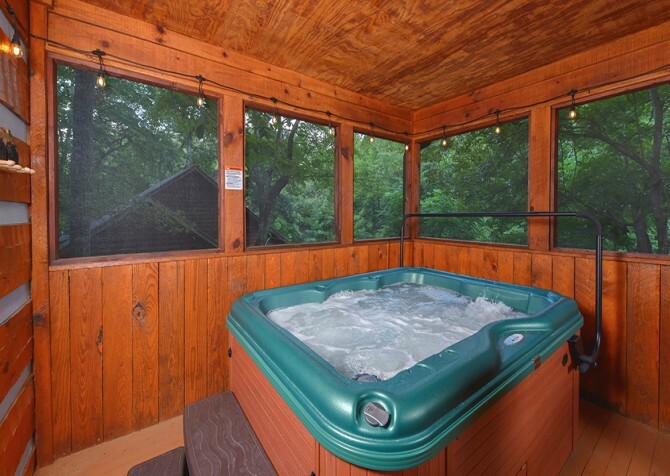 Soak in the hot tub at the end of a busy day, play with your pup at this pet-friendly cabin, or enjoy community amenities like a pool and catch-and-release pond! 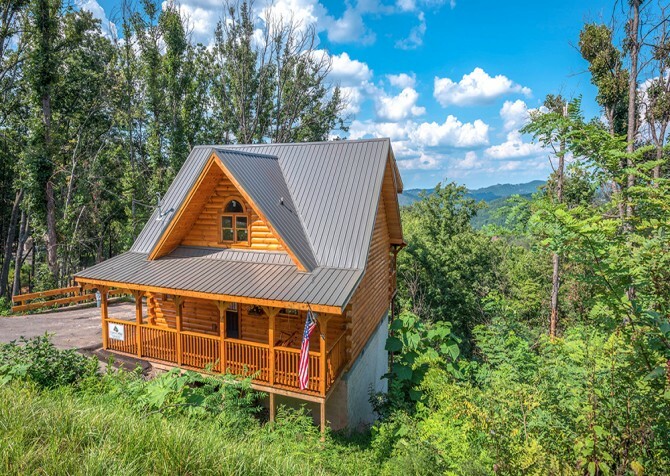 Get Swept Away in this beautiful, newly built cabin for couples in Gatlinburg. Tucked peacefully among the trees – but not far from the fun of downtown – its’ the best of both worlds. Enjoy high-end finishes, modern amenities, updated mountain style, and lots of great amenities to relax and have fun! 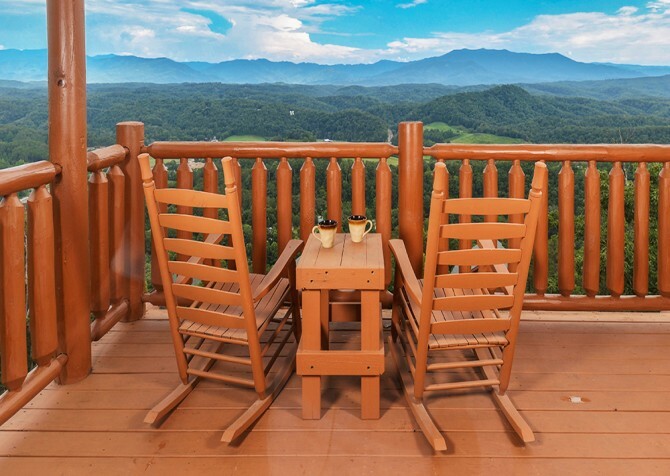 In the mornings, start with a cup of coffee at the 2-person table overlooking the Great Smoky Mountains. 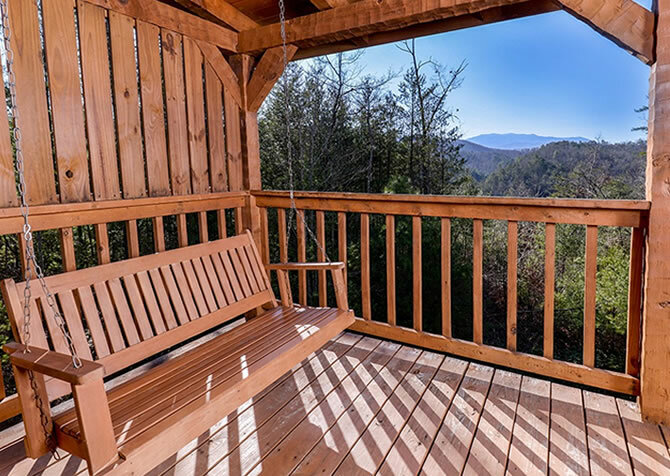 Whether it’s a romantic getaway or a small family vacation, this picturesque cottage surrounded by Smoky Mountain forestry boasts a lovely front yard with a charcoal grill with shade, a large master suite with an indoor jetted tub, and relaxing views from the porch swing. Spend tranquil afternoons lounging by the community pool, dining in the soft natural light drifting inside through the white curtains, shooting pool while sipping on local wines, and reading books while relaxing in the deck’s cushioned seating before romantic evenings cuddling by the fire, watching movies while soaking in the large indoor jetted tub, and drifting off to sleep in the master suite’s queen-size bed. 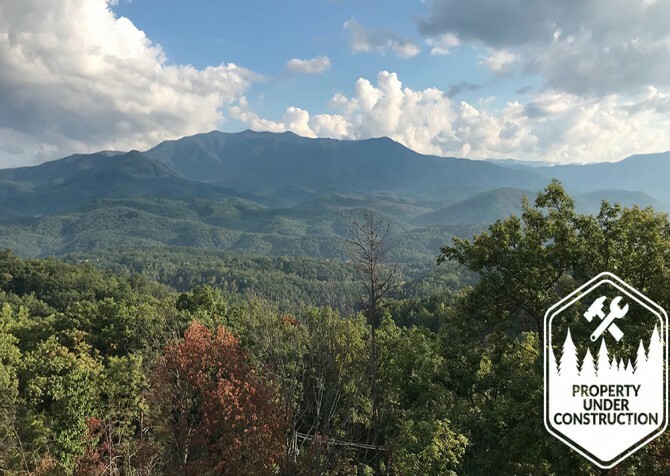 Escape to the Smokies at The Best Cabin Ever, featuring 2 king bedrooms, 2 full bathrooms, a fully equipped kitchen, room for 8 guests, and bonus amenities galore! Splash at the community pool, play pool and air hockey, beat arcade scores, enjoy mountain views from the bubbly hot tub, and curl up for a good read by the electric fireplace. The perfect place to call home for a family vacation, a romantic retreat for couples, or a weekend with friends, Tennessee Memories is a 2-bedroom, 2-bathroom cabin for 6 with great amenities, from queen-size beds, a fully equipped kitchen, and high-speed Wi-Fi to a game loft with a pool table, outdoor hot tub with woodsy views, and community pool access in summer! 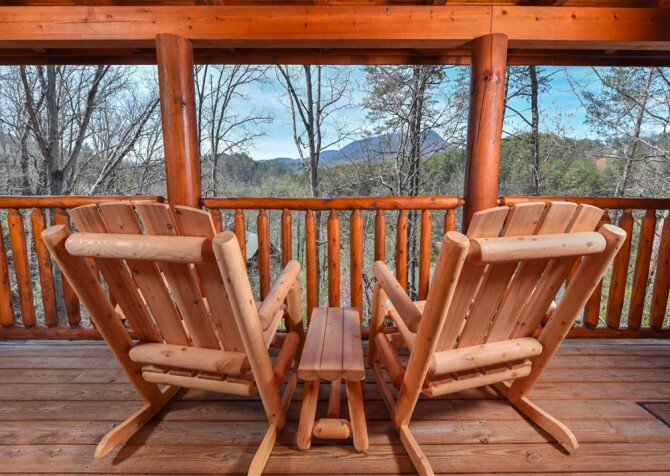 Step onto the spacious deck at this 2-bedroom cabin for stunning mountain views. Inside, gather around the wood-burning fireplace while watching TV or make snacks and home cooked meals in the beautiful kitchen with stainless appliances and rich red cabinets. Jackson's Cabin also boasts TVs in the bedrooms, high-efficiency washer and dryer, board games, bumper pool, poker table, and an outdoor fire pit! 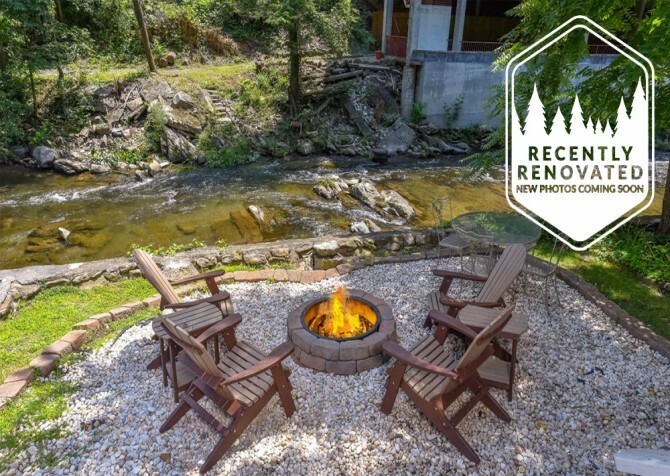 Families and small groups looking for a peaceful getaway in the Smokies should check beside the river—at River’s Edge! This 2-bedroom cabin comes with an outdoor hot tub, a soothing indoor jetted tub, a pool table, a giant flatscreen TV, and updated mountain décor. For a quiet place to take in the sights and enjoy each other’s company, get away to River's Edge with family and friends. 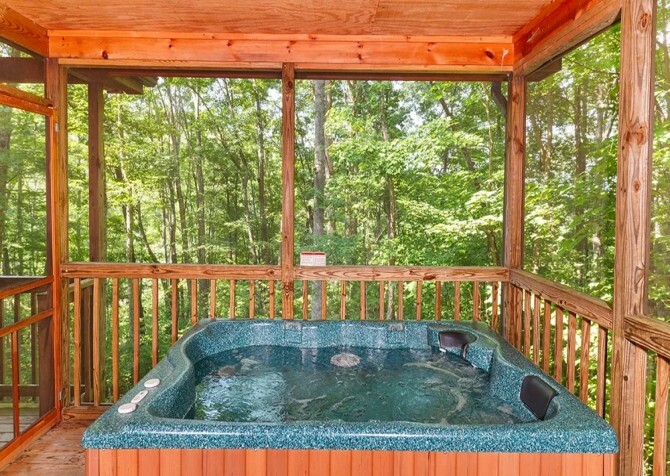 Feel your stresses melt away as you soak in the hot tub on the screened-in porch of this cabin rental. 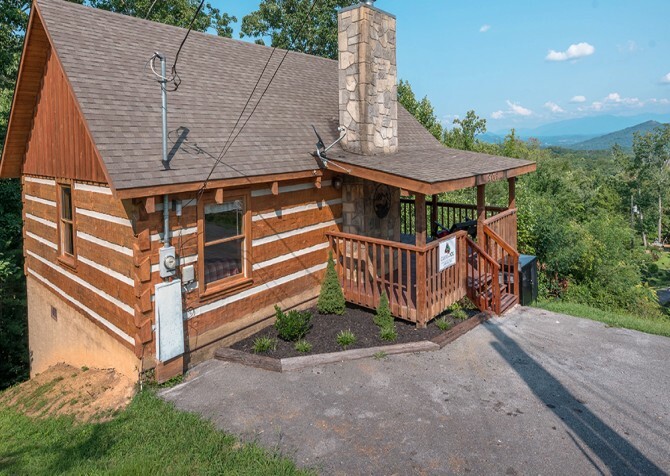 A cozy 1-bedroom, 1-bathroom escape, this cabin is less than 4 miles from downtown Pigeon Forge, close to the attractions, restaurants, and shops. Stainless appliances in the full kitchen and comfortable furnishings throughout will make you want to stay a while. Spend days splashing in your private indoor pool at the beautiful 2-bedroom +loft Highland Plunge! 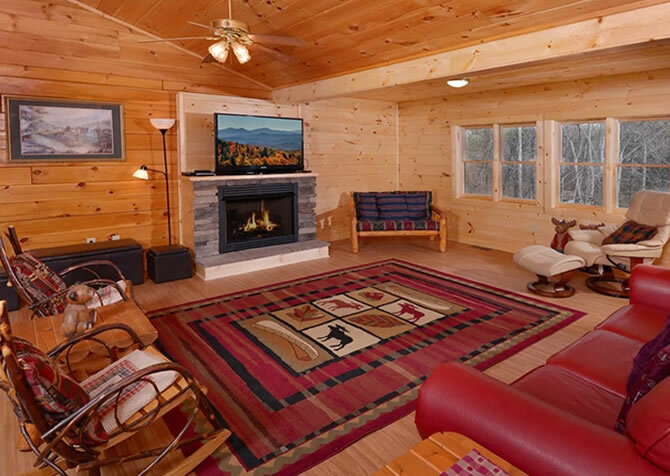 This cozy cabin packs a punch, with a private home theater for awesome movie nights, a soothing hot tub, internet access, a fun shuffleboard table, and tons of conveniences to make you feel at home in the mountains! With 2 bedrooms and 2 bathrooms, Cozy Corner is a great choice for small group getaways to Pigeon Forge. This newly redecorated cabin offers wooded views from its rocking chair porch along with an updated kitchen, a large living room complete with game tables, and a double-sided gas fireplace for cool mountain nights. 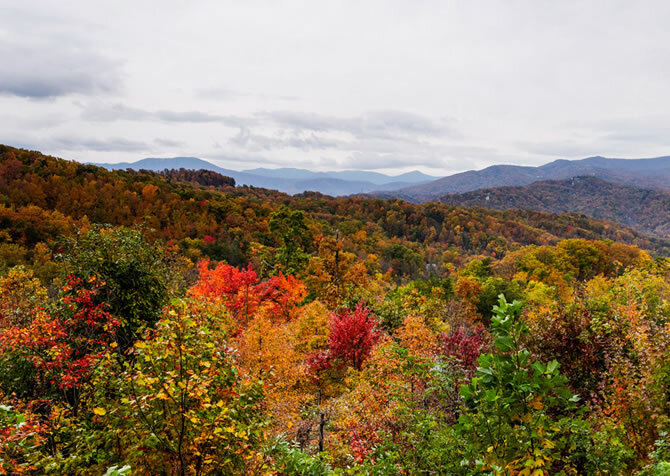 Enjoy all this with less than a 6-mile drive to downtown Pigeon Forge! Honey Bear Heaven can comfortably accommodate up to 4 guests with its bedroom and additional sleeper. Other amenities to look forward to include a fully equipped kitchen, a cozy living room, a covered porch complete with rocking chairs, and seasonal mountain views. You’ll find all this with less than a 4-mile drive to downtown at Honey Bear Heaven. 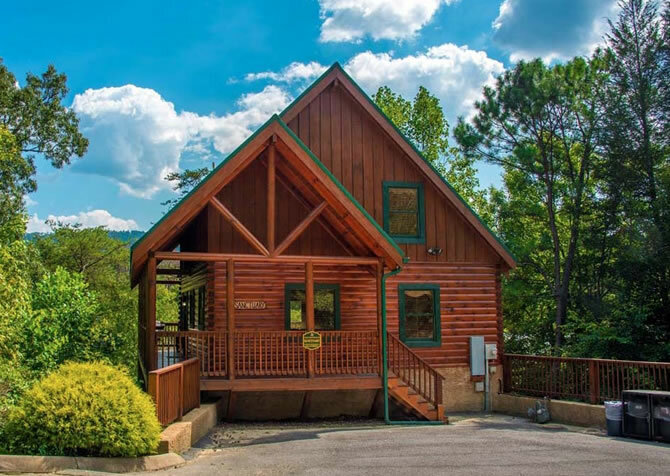 With room for up to 8 guests, this 2 bedroom + loft, 2 bathroom cabin in Pigeon Forge is ideally sized for a family vacation. 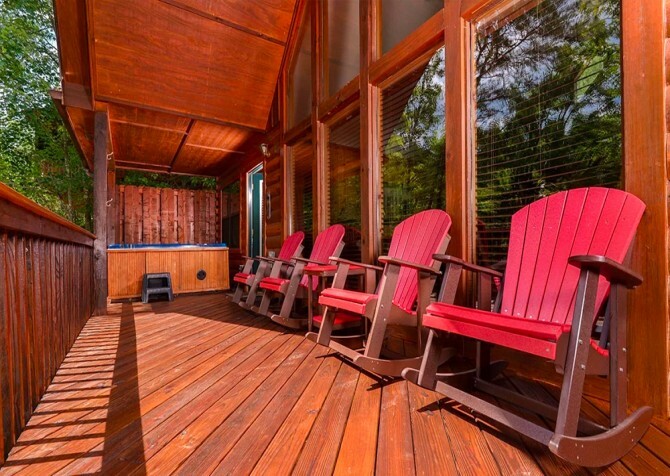 The covered deck features rocking chairs, a swing, an outdoor hot tub, and a gas grill. 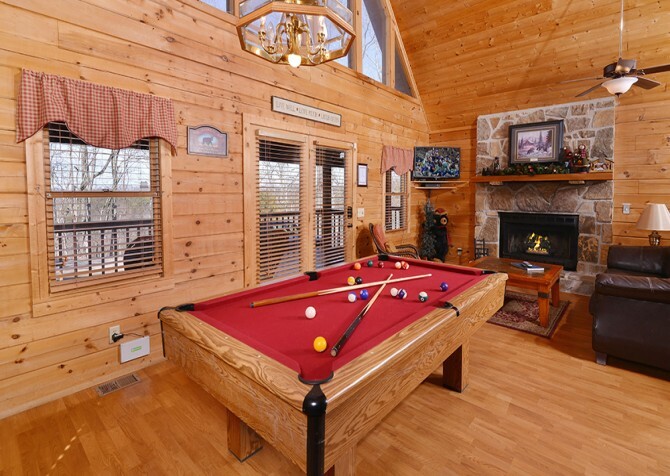 Inside, the warmth of the electric fireplace fills the living room, and the pool table provides hours of fun. Book your memorable cabin stay at Legacy View in Pigeon Forge, TN! This cozy home features 1 king bedroom, 2 full bathrooms, and space for 8 guests. 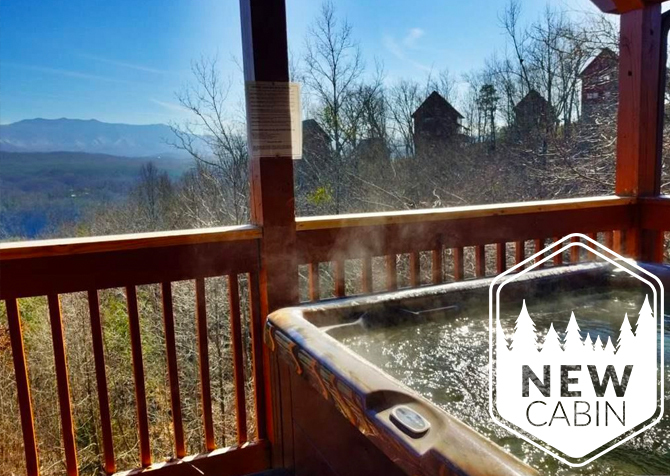 Soak in the outdoor hot tub, sip vino in the rocking chairs with stunning mountain views, read by the cozy fireplace, plus play foosball, pool, and arcade games in the rec loft! Less than 5 miles from downtown Pigeon Forge, Bearway to Heaven is conveniently located without sacrificing amazing mountain views. It boasts a spacious game room with pool table and arcade games, a 65-inch TV, access to community amenities, and beautiful bedrooms with their own TVs. It all adds up to a great escape after busy days playing in downtown Pigeon Forge! 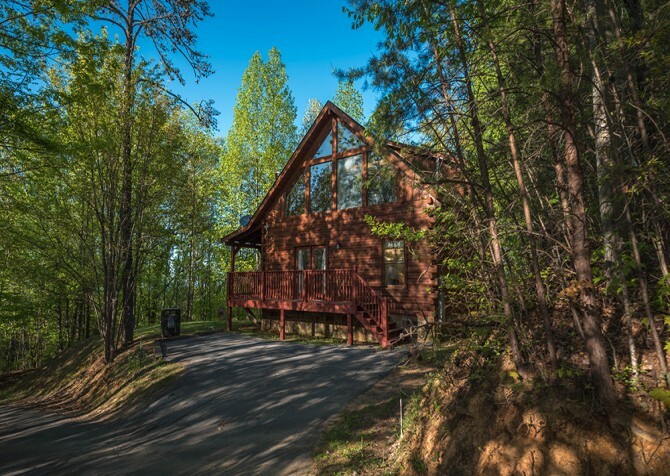 Bring friends and family for a vacation to remember at Little Smoky Hideaway, a 1-bedroom, 2.5-bathroom cabin for 4 in the Smokies! Play games in the rec room, whip up feasts in the fully equipped kitchen, sway on the porch swing with a mug of cocoa, soak in the outdoor hot tub, and climb into the king-size bed for a restful snooze. At 1,400 square feet, SlumberJack has plenty of space for up to 7 guests, with a king bed, queen bed, 2 twin beds, and a sleeper sofa. This 2-bedroom, 2-bathroom cabin also comes with a fully equipped kitchen, cozy living room with a big screen TV and fireplace, rocking chairs and a hot tub on the deck, and a foosball table plus arcade unit. 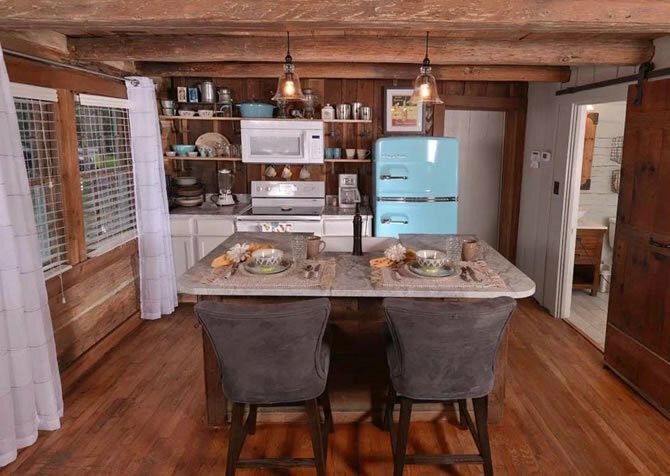 Feel at home in this 1-bedroom Pigeon Forge cabin. It offers a fully-equipped kitchen, high-speed internet, a covered hot tub, a pool table, and a big screen TV. Take the short 3-mile drive to downtown attractions and restaurants, or stay in for home cooked meals and relaxing nights by the fire. Park and unpack with ease in the flat driveway or start the day with a soak in the indoor jetted tub. 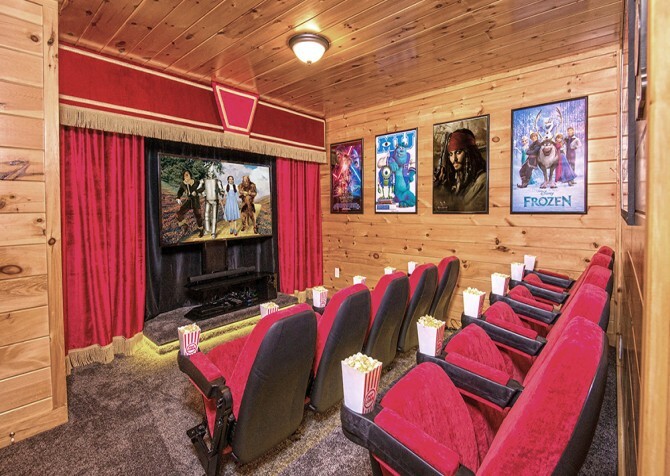 From a pool table and theater room with 65-inch smart TV and Netflix streaming to wireless internet and a Blu-ray player, this 1-bedroom cabin has plenty of entertainment to keep kids and adults happy. 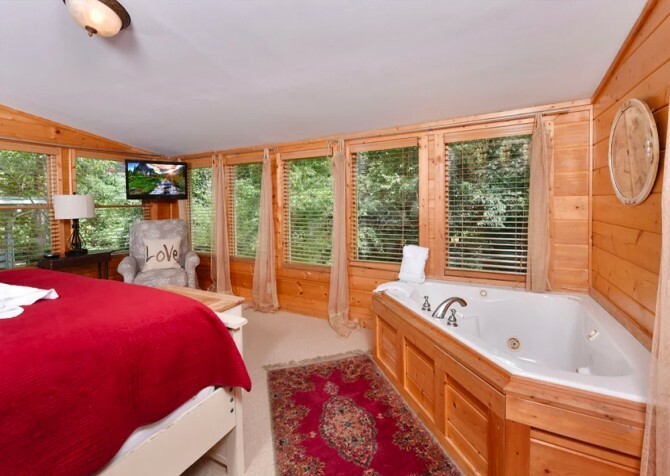 You can also relax, with a jetted tub inside, electric fireplace, cozy living room, and rocking chairs overlooking the trees. Bring the entire family to Knotty and Nice for a semi-private retreat in the Smoky Mountain woods. This cabin features 1 bedroom, 2 bathrooms, and room for 6 guests, with a king-size bed for the adults and twin bunk beds for the kids. 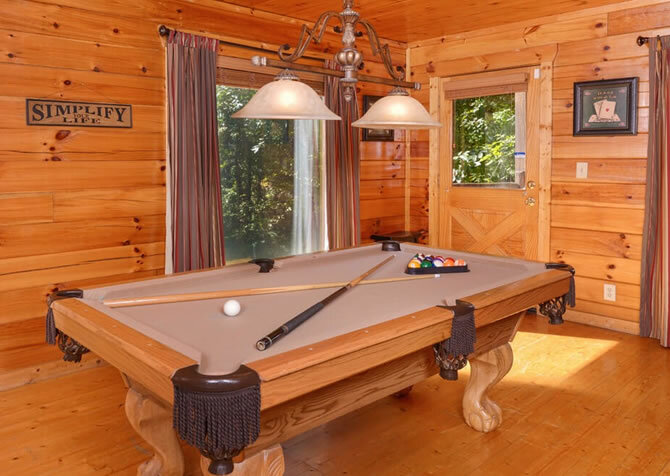 Enjoy a pool table, relaxing outdoor hot tub, soothing indoor hot tub, wraparound porch, and charcoal grill during this year’s getaway to Pigeon Forge. 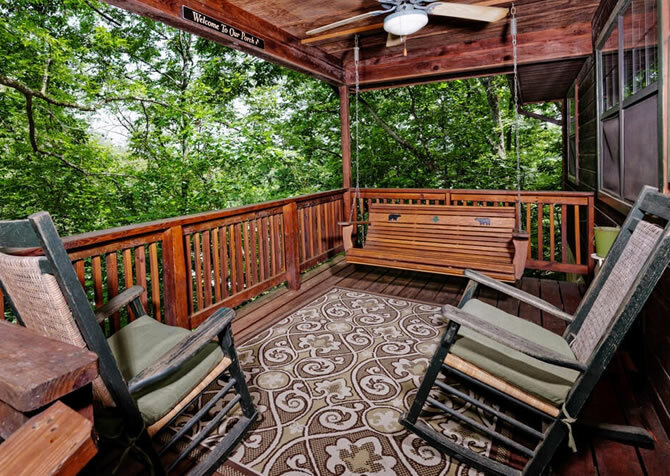 Sleeping up to 4 guests, this 1-bedroom, 1.5-bathroom cabin in Pigeon Forge offers multiple decks with a porch swing, hot tub, rocking chairs, and peaceful wooded views. Step inside for homemade meals from the fully equipped kitchen, pool and dart tournaments, movies on the flatscreen TVs, and cozy cuddles by the stacked-stone fireplace. Siesta Ridge offers many amenities and comforts for a family vacation or weekend with friends. Its location in Black Bear Falls provides community pool access, and this 2-bedroom cabin boasts space for 8, a full kitchen, a cozy living area, TVs in the bedrooms, a pool table, wireless internet, a charcoal grill, and plenty of outdoor space. When you're done exploring downtown, come back to this cozy retreat! 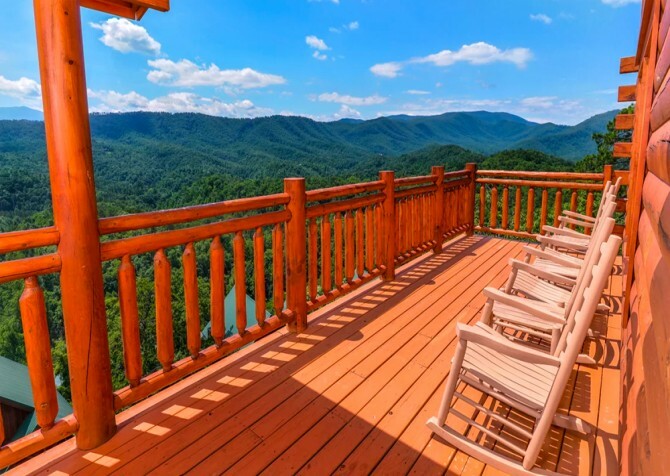 A beautifully decorated cabin in Pigeon Forge, Villa Bellissimo boasts gorgeous views, luxurious amenities, and spacious interiors. 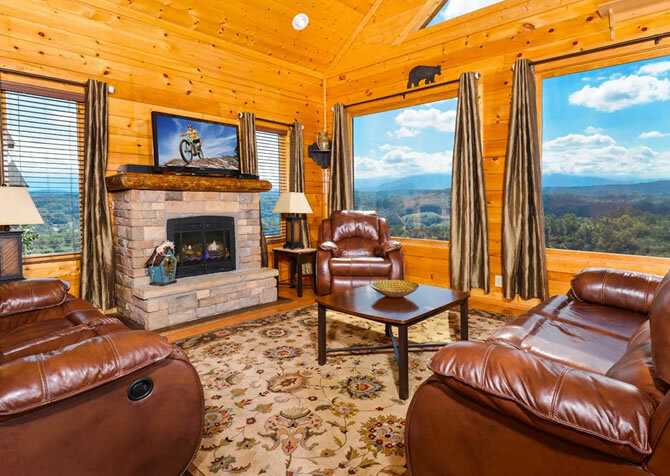 Plush leather sofas, large windows with breathtaking views, a flatscreen TV, and an electric fireplace complete the relaxing living room, and mountain views can be found from almost every space in the cabin, including the rec room and theater room. 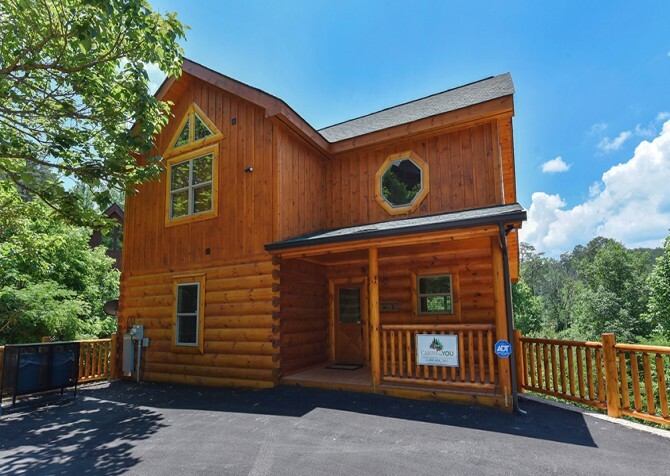 Located in Little Valley Mountain Resort, A Walk in the Clouds is a 2-bedroom, 2-bathroom cabin for up to 8 guests in Pigeon Forge, TN. 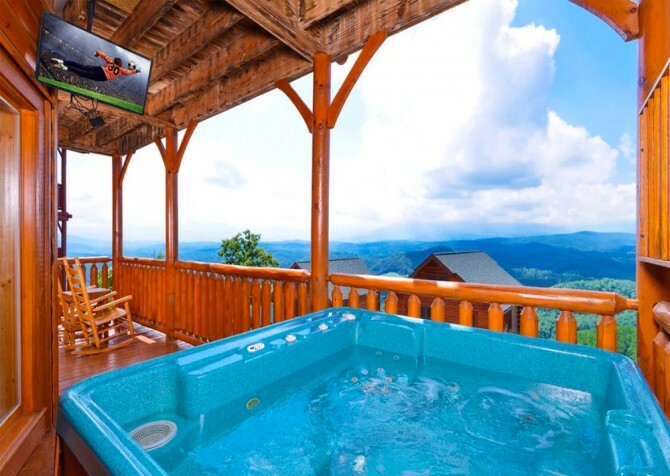 Unwind in the bubbly hot tub, whip up barbecue feasts on the gas grill, beat the highest arcade scores, chat with your bestie by the mood-setting fireplace, and enjoy uplifting Smoky Mountain views for miles! 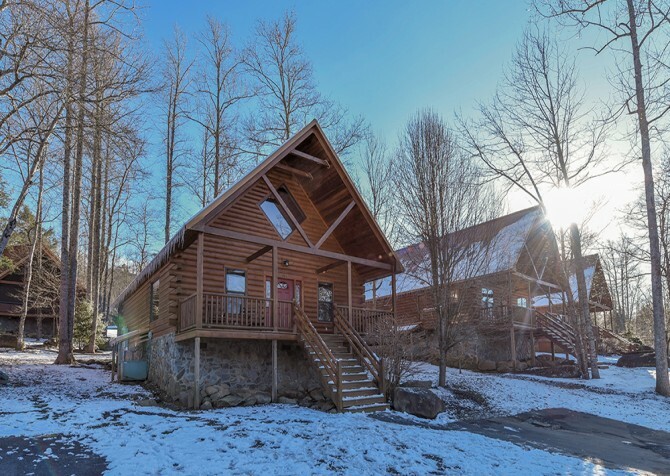 Featuring 2 cozy bedrooms, 3 full bathrooms, an open-concept living area, a fully equipped kitchen, a game-filled rec room, 2 big screen TVs, an outdoor hot tub, a charcoal grill, and a gas fireplace, Wholly Smokies sleeps up to 6 guests and is the perfect mountain abode for a family vacay, couples’ retreat, or getaway with friends in Pigeon Forge, TN. 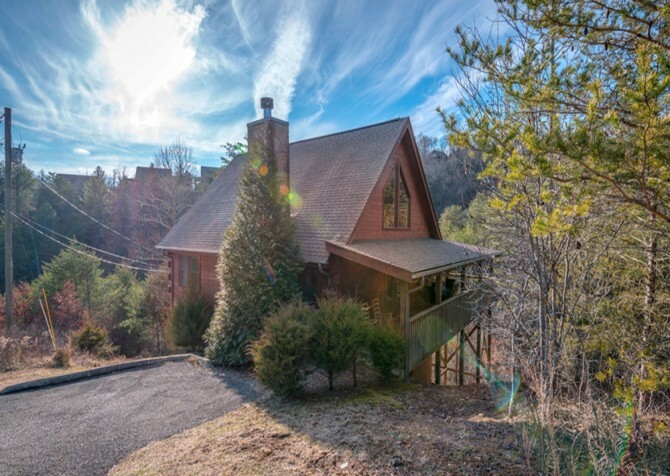 Featuring 2 bedrooms + loft, 2.5 bathrooms, a fully equipped kitchen, theater room, rec area with pool table, a spacious firepit zone, plus complete seclusion in the forest of the Smokies, Country Bears Cabin offers a private mountain home for 8, perfect for family vacations, getaways with friends, or a couples’ retreat. 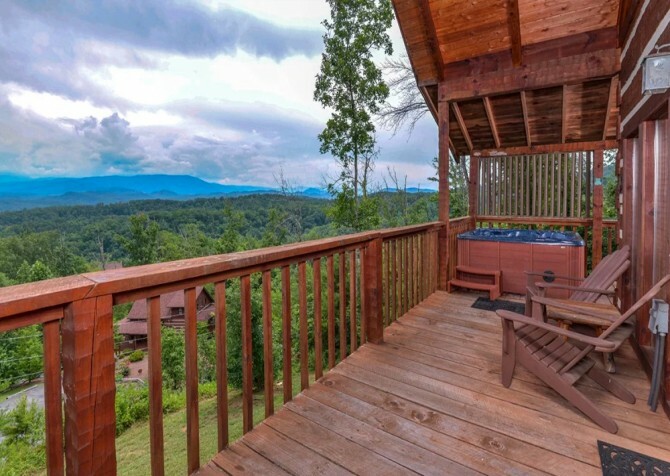 Enjoy a dreamy retreat when you vacation to this luxurious Gatlinburg cabin rental. The bedroom of this log cabin features open space, with a romantic claw-foot tub and large shower with a double-sided gas fireplace that reaches into the living area. 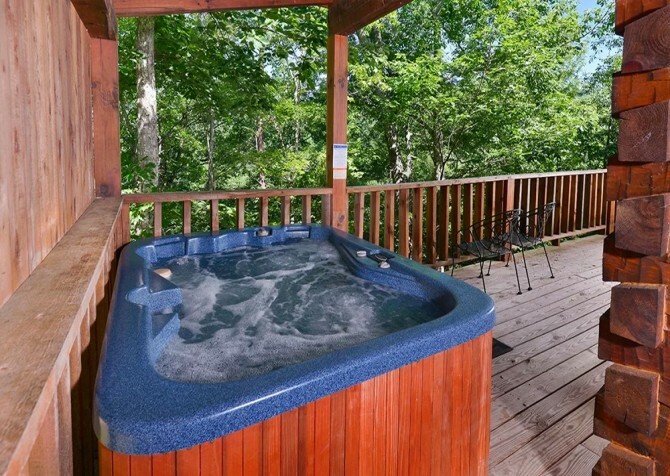 A recessed hot tub and pool access make this cabin a great choice for a getaway year-round! 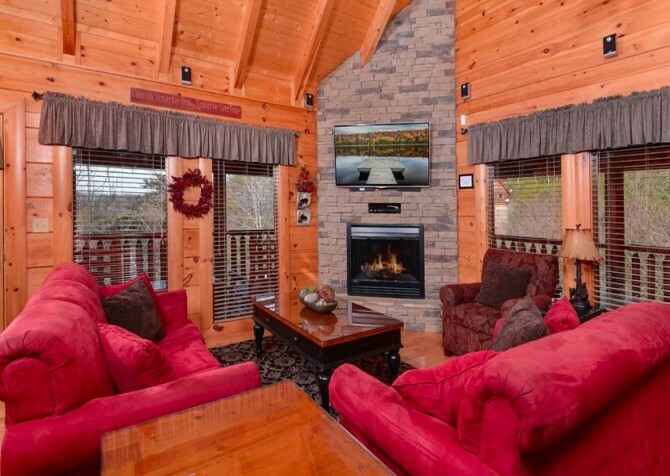 A Pigeon Forge cabin loaded with amenities, A Moment in Time boasts everything from wireless internet and a full kitchen to a home theater with surround sound and reclining leather chairs! 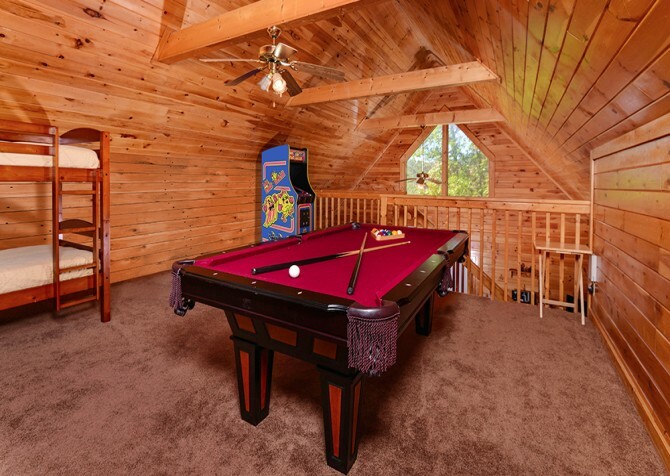 Plus, play arcade games and air hockey, shoot some pool, or relax on the peaceful covered deck in the serenity of the Smoky Mountains. It's a great all-around mountain getaway! Slip away for cozy night by the wood-burning fireplace, relaxing afternoons in the porch swing and hot tub, and fun days playing pool in Irresistible! This 1-bedroom cabin is a romantic retreat for couples or a fun weekend for friends, and it's even pet friendly! 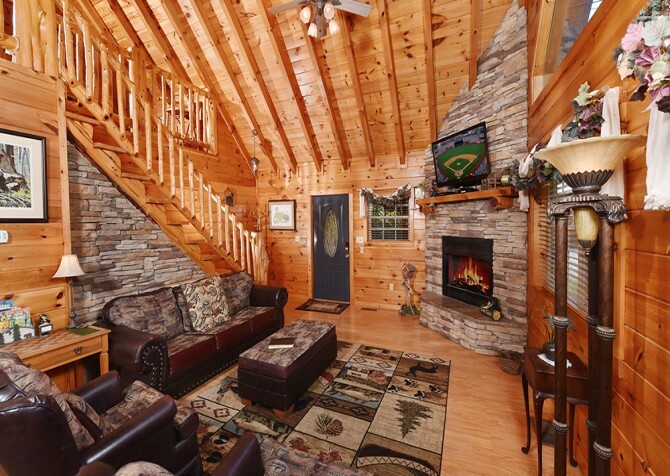 Luxurious yet comfortable, this Pigeon Forge cabin is located in the Bear Creek Crossing Resort. 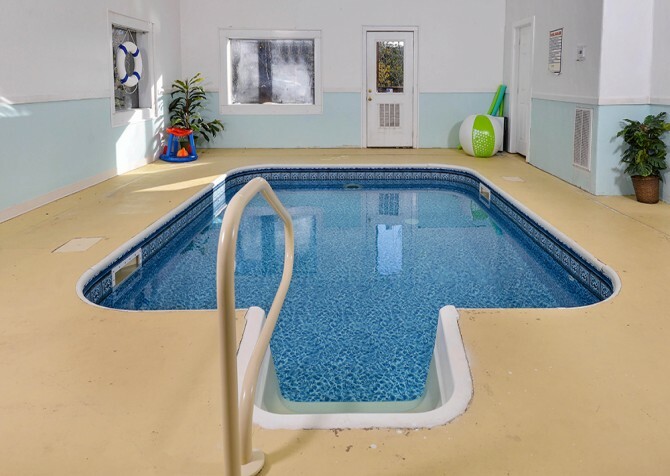 Enjoy the access to both indoor and outdoor community pools. In your down time, you can play on the air hockey, foosball, or pool tables. 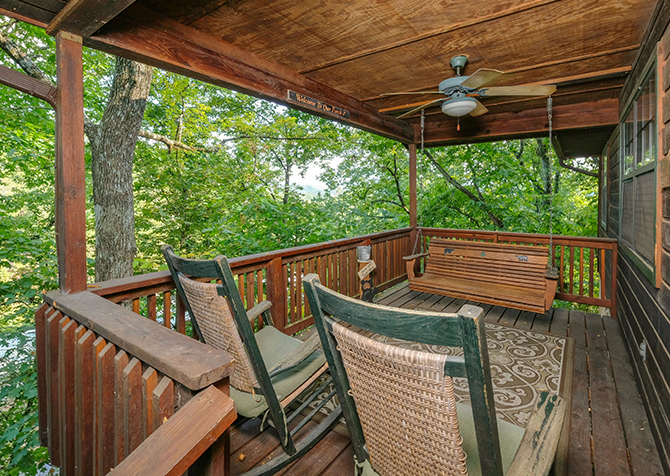 A large porch offers an outdoor hot tub and several rocking chairs for drinking in the fresh mountain air. 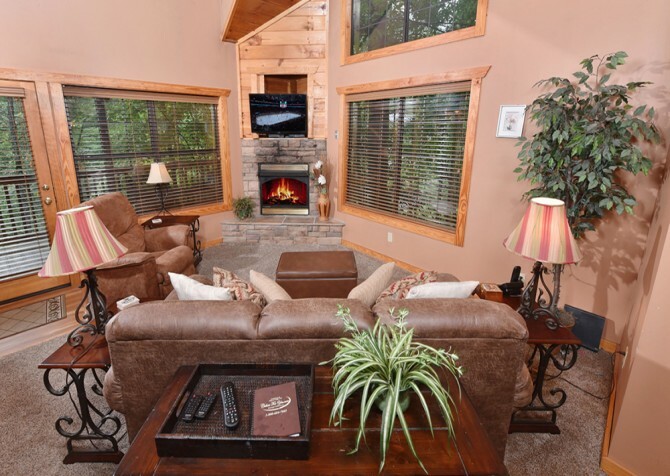 Get away for a relaxing Smoky Mountain vacation at Lasting Impressions. This 1- bedroom, 1-bathroom cabin with room for 4 guests is great for couples and small families. It boasts a king-size bed, a TV in the bedroom, an arcade game table, a gas fireplace, an indoor jetted tub, an outdoor hot tub, and much more! Plus, you're just a few miles from downtown's attractions, restaurants, and shops! 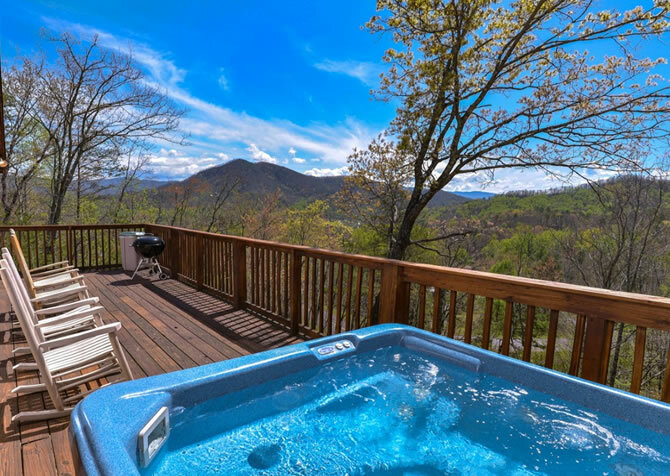 Escape to the mountains for some quality time with family or friends in Brink of Paradise with wraparound decks, an outdoor hot tub, and more! Plus, just minutes from downtown, it’s convenient to the restaurants, attractions, and shops of Pigeon Forge! 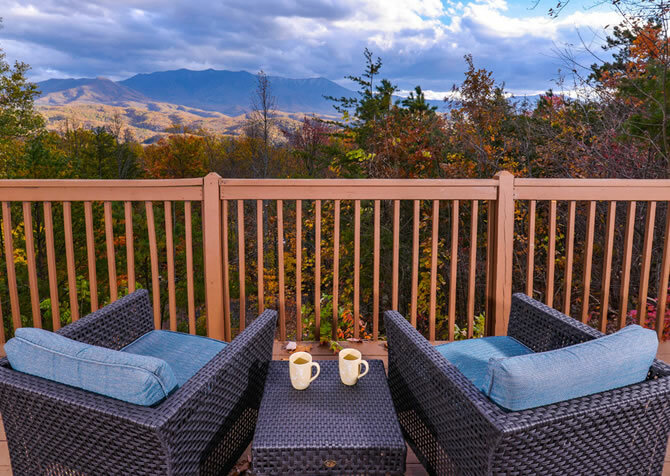 Perched high atop the Smokies, Tree Tops offers mountain views just minutes from downtown Gatlinburg. 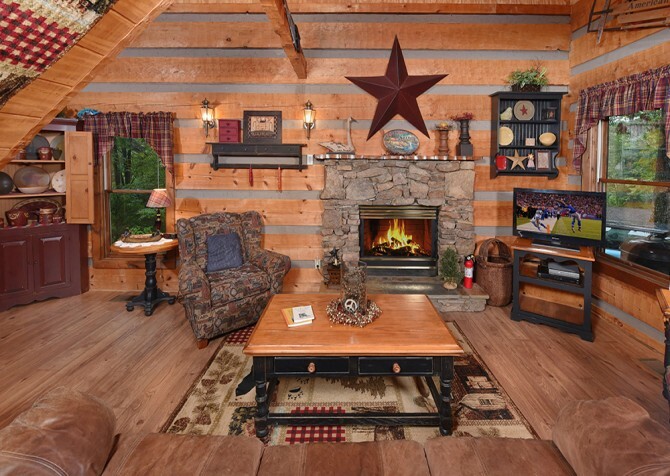 Stay near all the action while enjoying peaceful nights in this cozy 2-bedroom log cabin. Relax in the outdoor hot tub or indoor jetted tub, use the Wi-Fi to check out upcoming events, stay warm by the gas fireplace, and host a game tournament with the pool table and dart board! 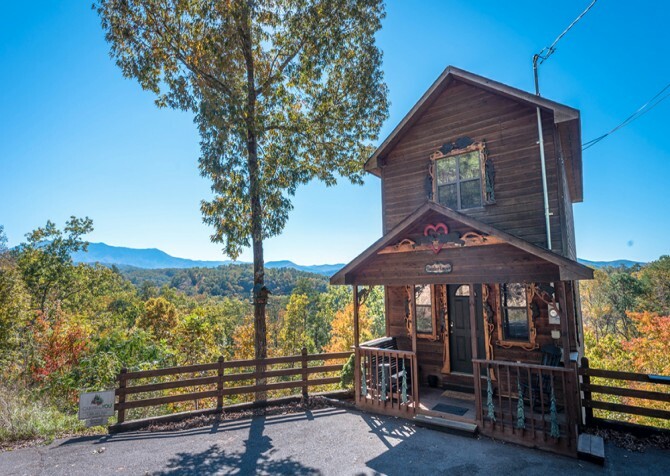 Around 3 miles to downtown Pigeon Forge, Peanut’s Paradise is a charming cabin close enough to experience the city but secluded enough to immerse yourself in the natural surroundings of the Great Smoky Mountains. Sleeping up to 8 people, this home away from home boasts 2 queen-size beds, a big screen TV, an gas fireplace, a fully equipped kitchen, and more - great for a fun family getaway! With 2 cozy bedrooms, 2 bathrooms, a fully equipped kitchen, a comfy living area, room for 4 guests, plus sweet outdoor spaces with tranquil river and wooded views, Keaton’s Sleepy Hollow is perfect for couples, friends, or a small family. Soak in the bubbly hot tub, sip morning coffee in the rocking chairs, dine together outdoors, and enjoy evening baths in the jetted tub. 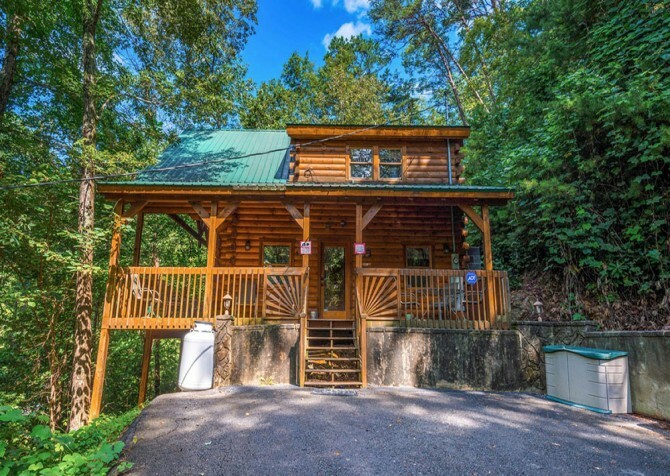 Nestled quietly between downtown Pigeon Forge and Gatlinburg, this 2- bedroom Pigeon Forge cabin is a great family escape. 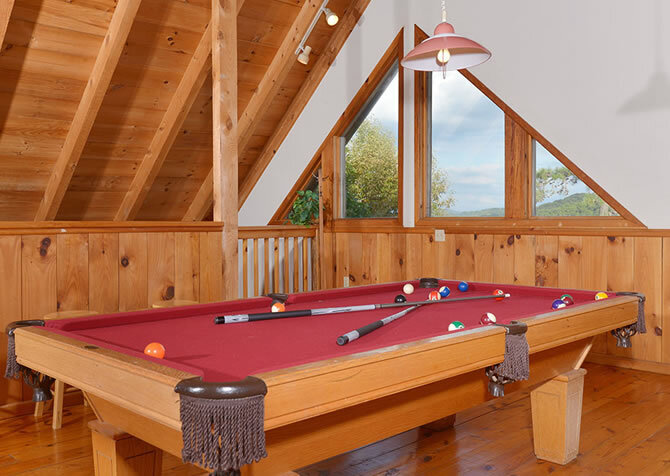 This charming cabin is filled with games, including a pool table and board games. A charcoal grill is perfect for a summertime meal, and a DVD player affords a quiet movie night with your family. Able to accommodate up to 10 guests, Unforgettable Views and a Theater is a spacious cabin, great for family vacations and small group getaways. 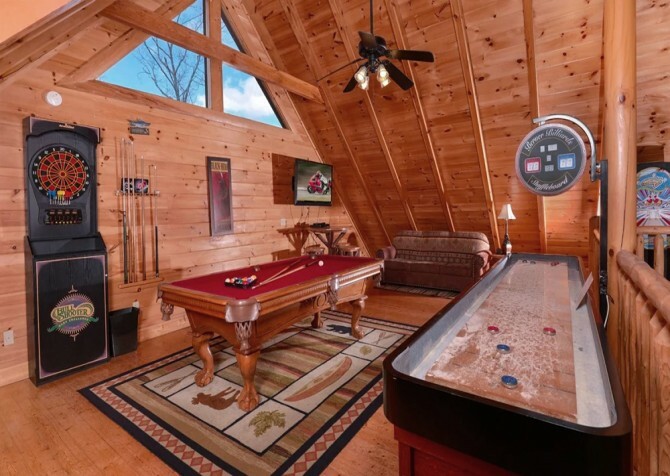 Enjoy multiple game tables in the rec room, a big screen TV, a heart-shaped jetted tub in the en-suite bath, a king-size bed, and amazing mountain views from your outdoor hot tub, rocking chairs, and porch swing.